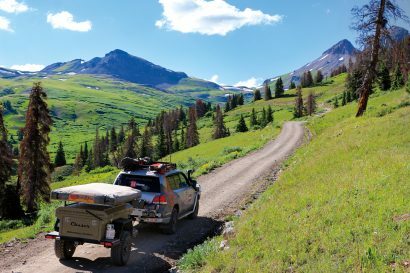 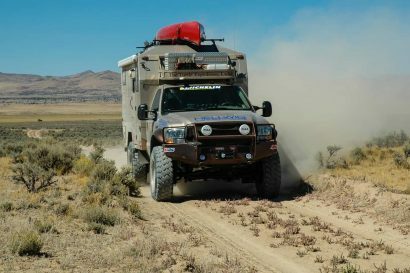 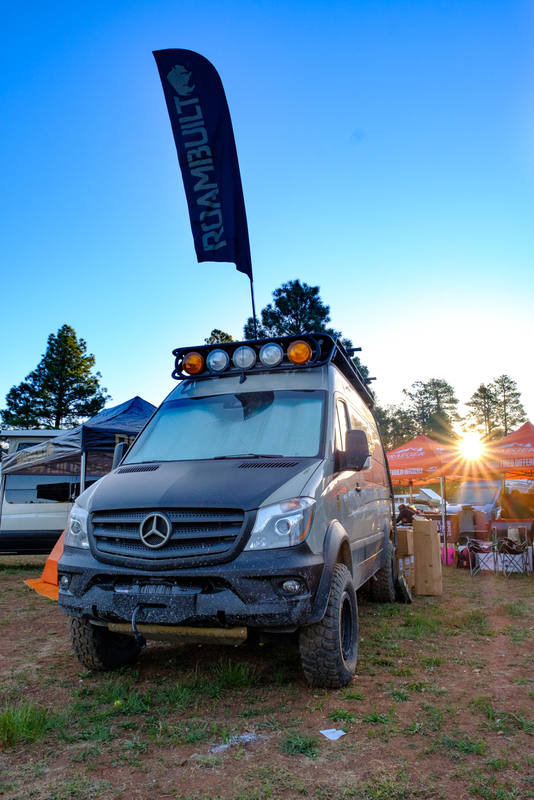 For the past few years, Overland Expo has had the misfortune to be plagued by wind, rain, and snow. 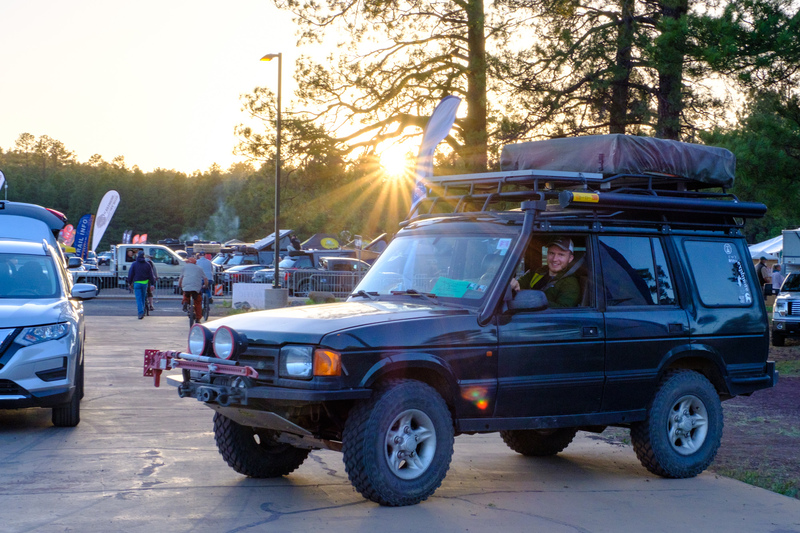 This year, the tides turned, and we found there was a torrent of a different kind: a flood of new people and amazing four-wheel drives. 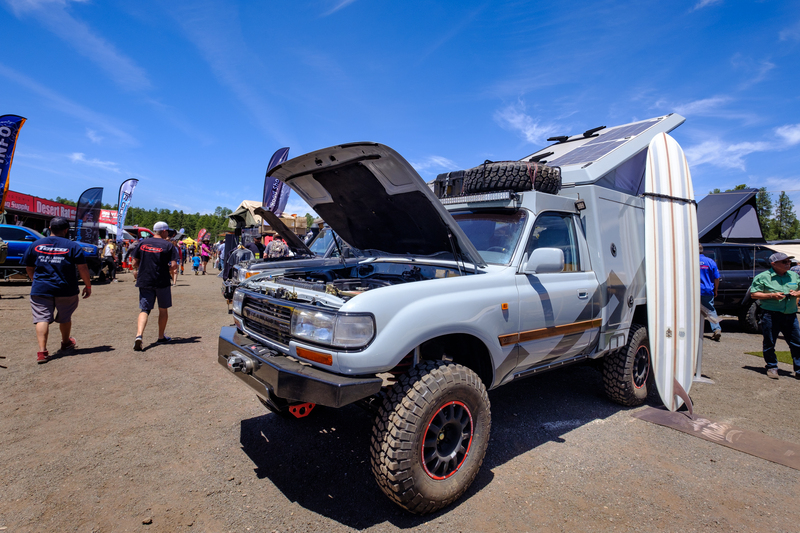 Vintage vehicles of every shape and size were set up throughout the campgrounds, trucks and SUVs with the latest and greatest equipment sparkled in the vendor section, and off-road-ready campers and trailers were scattered all over the event. 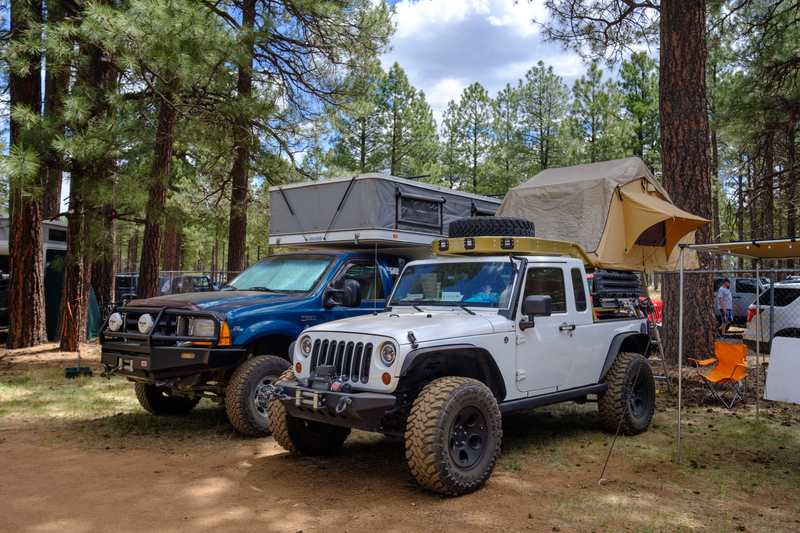 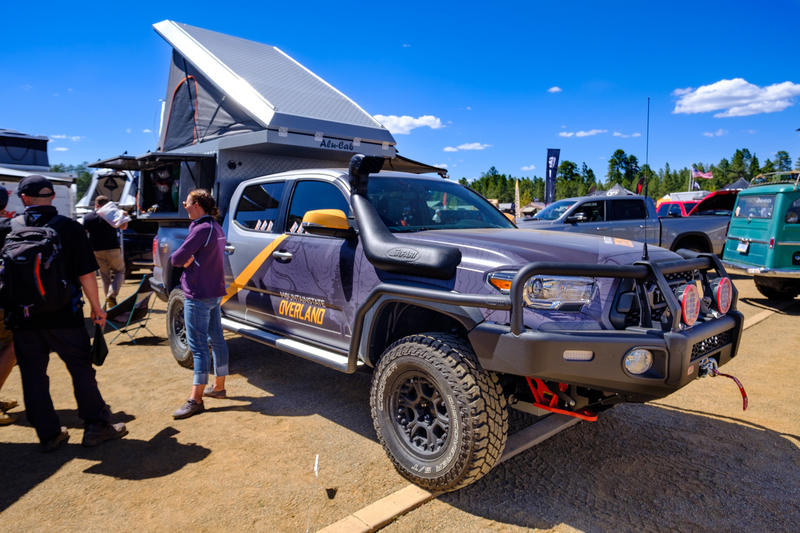 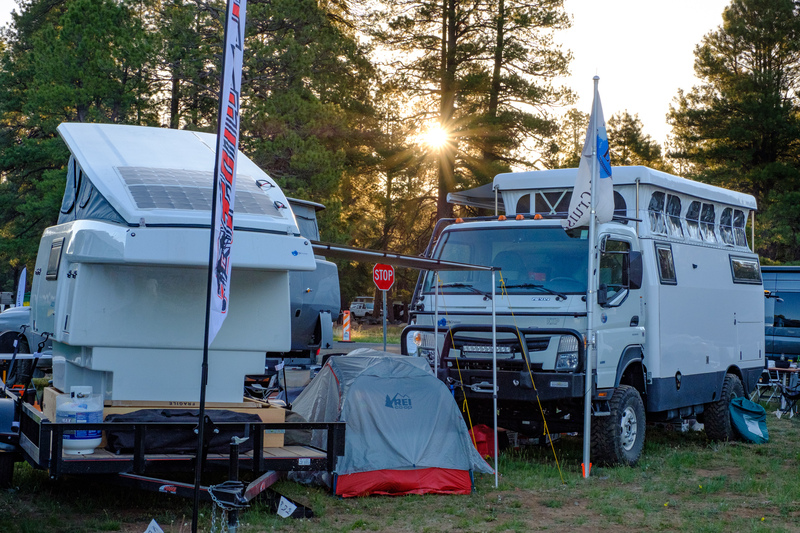 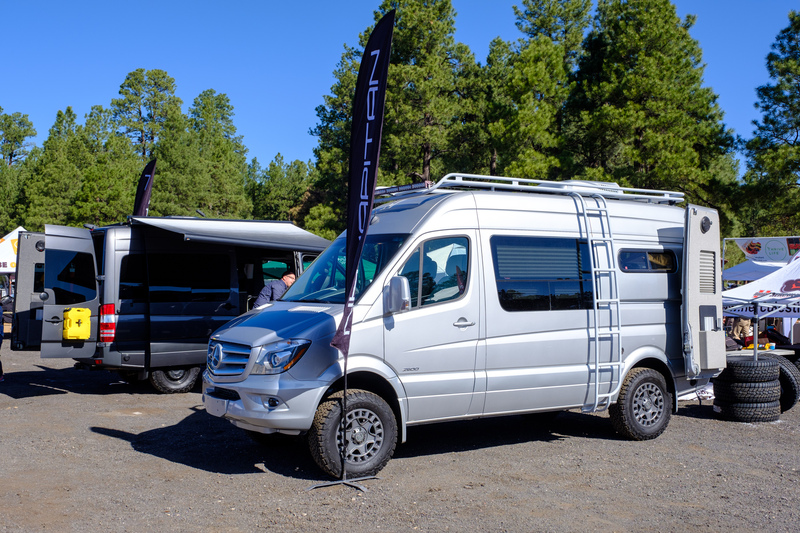 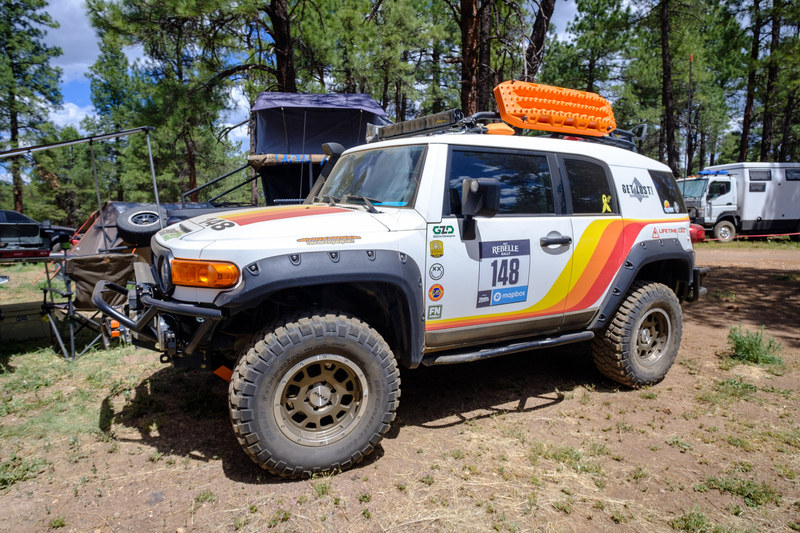 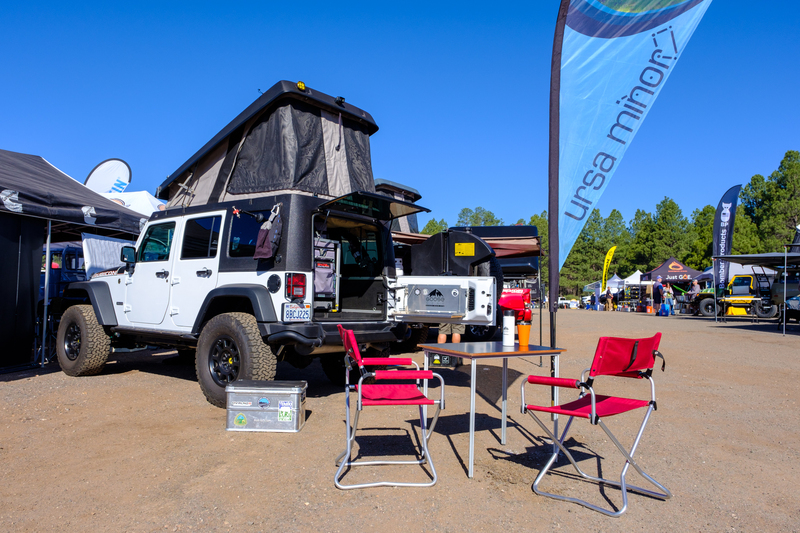 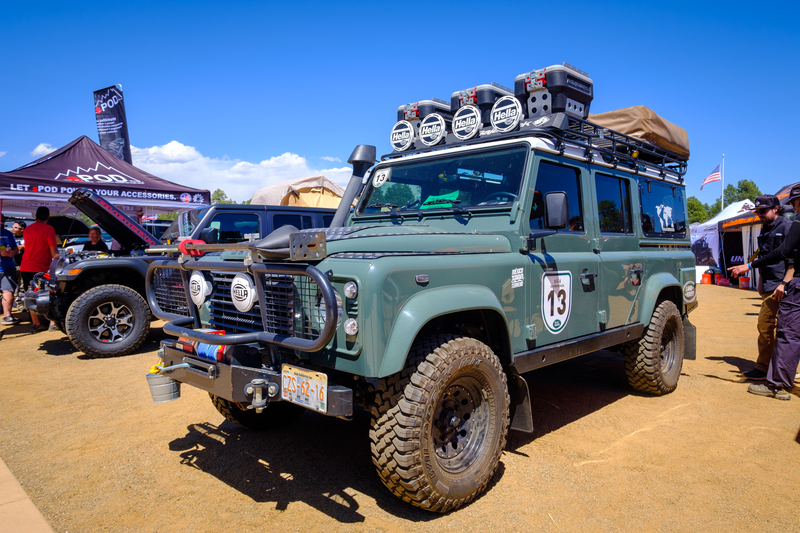 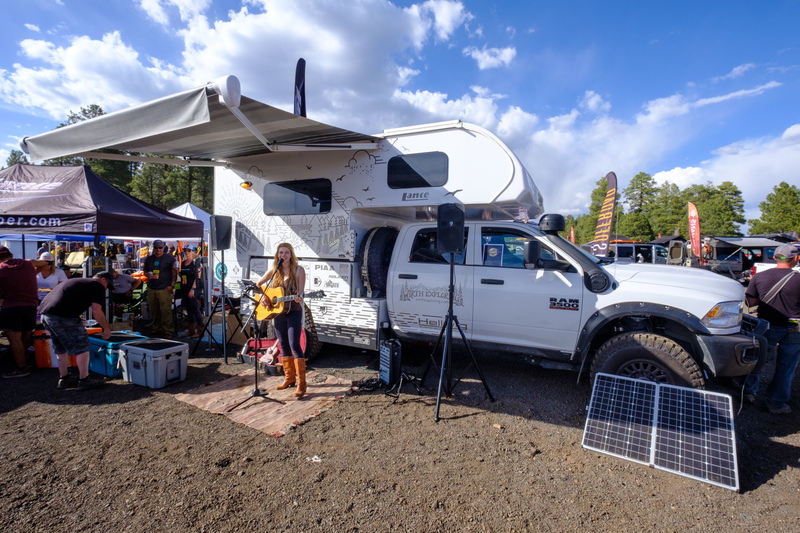 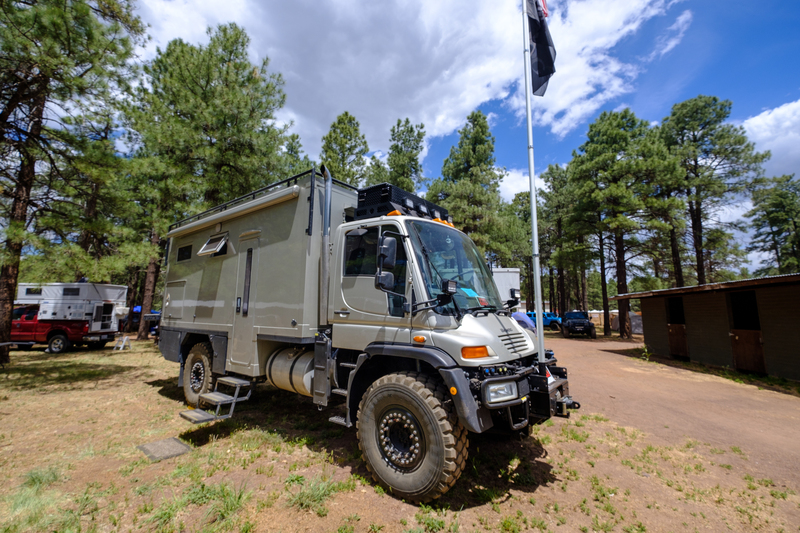 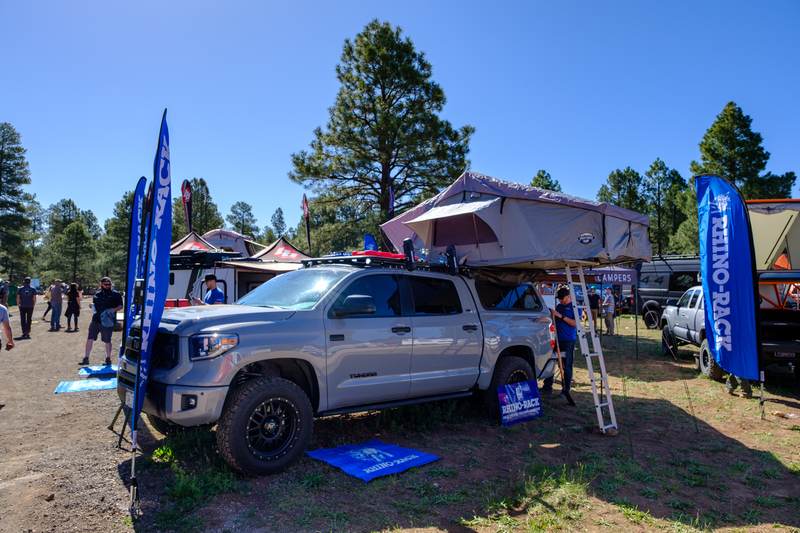 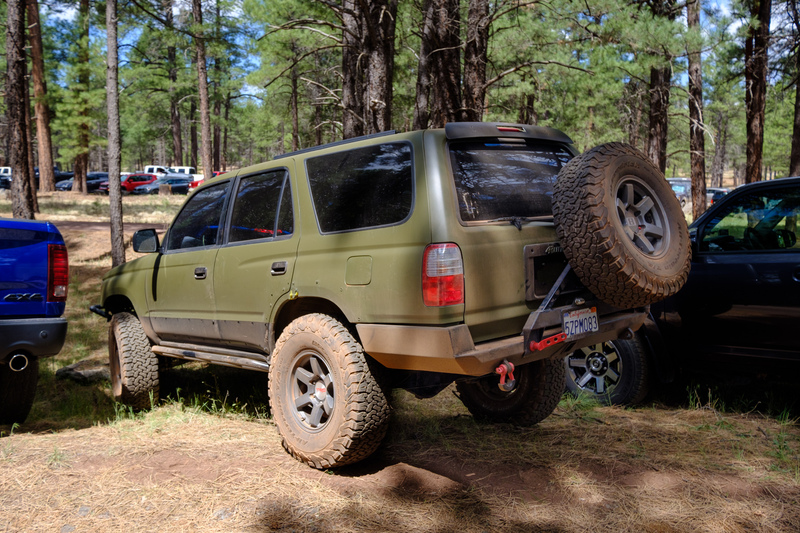 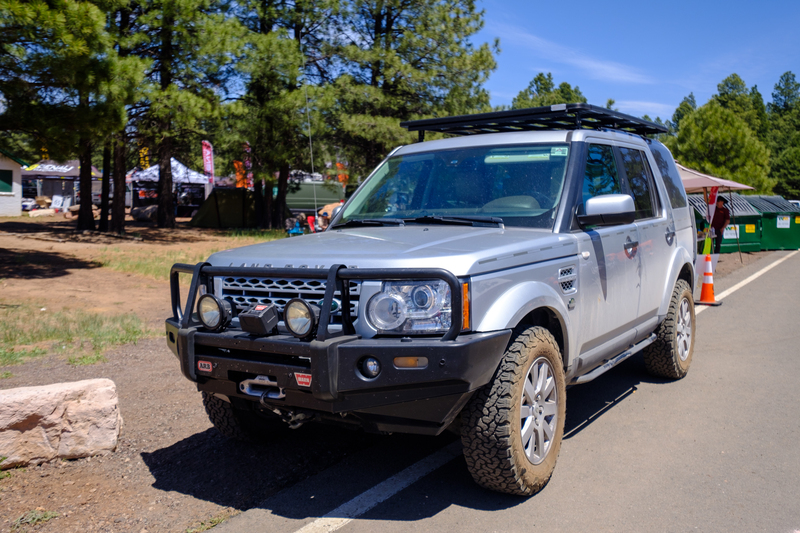 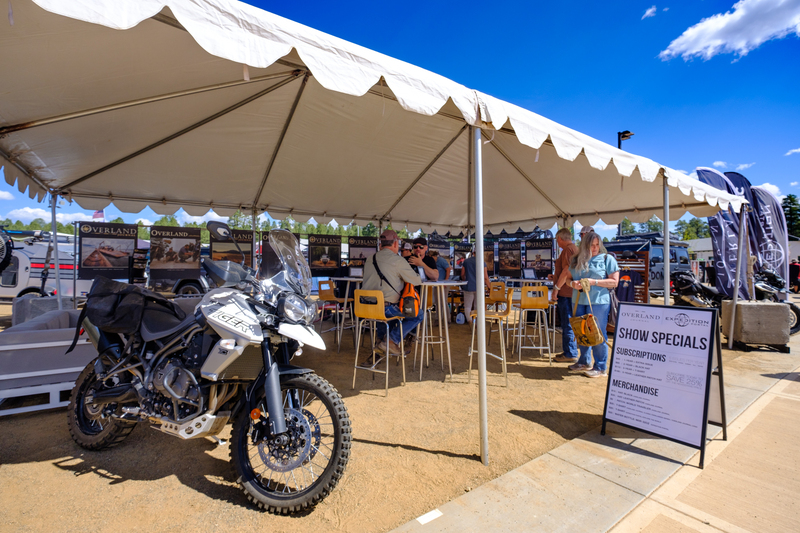 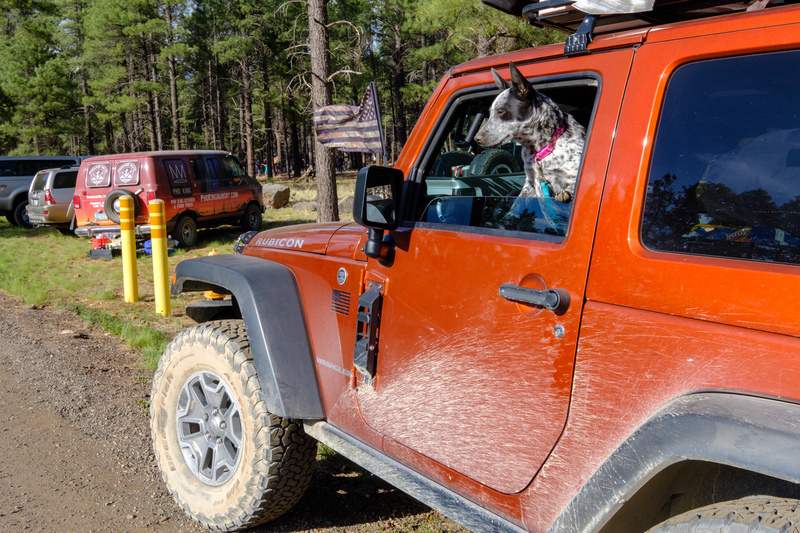 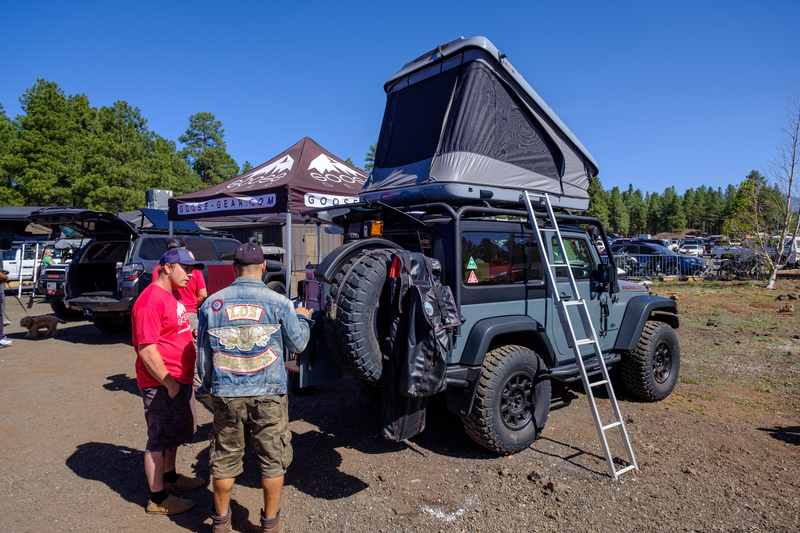 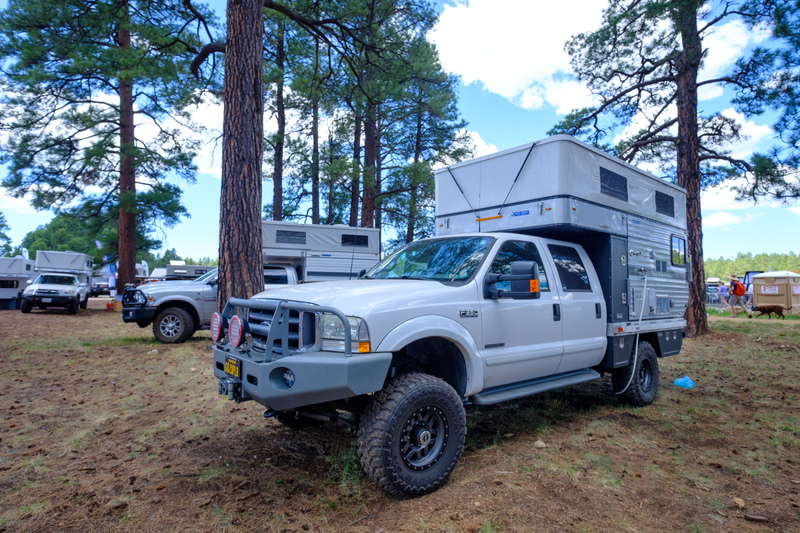 It was easy to see that Overland Expo 2018 was one of the biggest and most interesting gatherings thus far, and it was difficult to even take it all in. 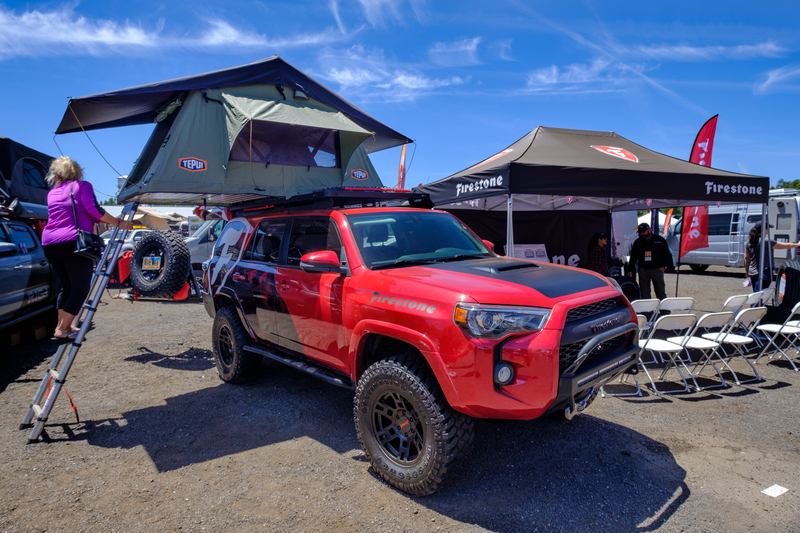 Now that a week has passed, we’re looking back at some of the 4x4s, campers, and trailers of the event and sharing them with all of you. 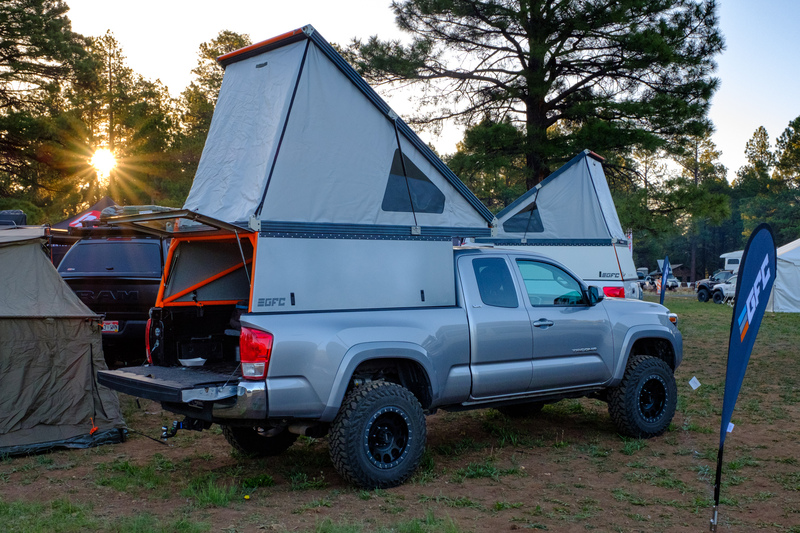 We hope you like them as much as we did! 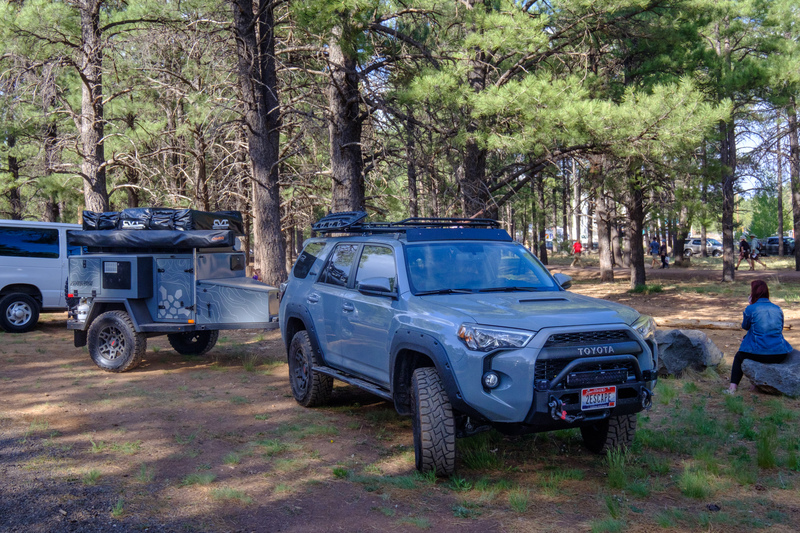 Turtleback Trailers showed up with some serious kit this year. 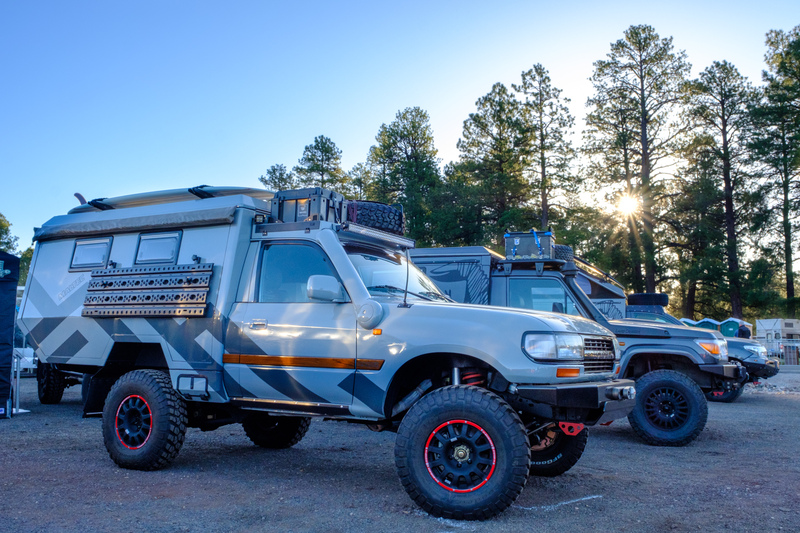 Not only did they have some gorgeous units with new upgrades, but they also rolled in with the Fuso and 4Runner seen above. 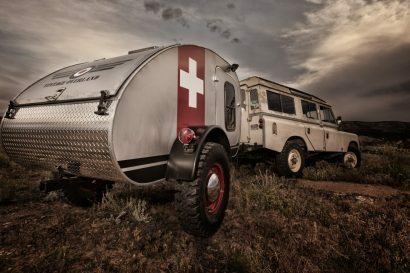 Can we really talk about campers without mentioning EarthRoamer? 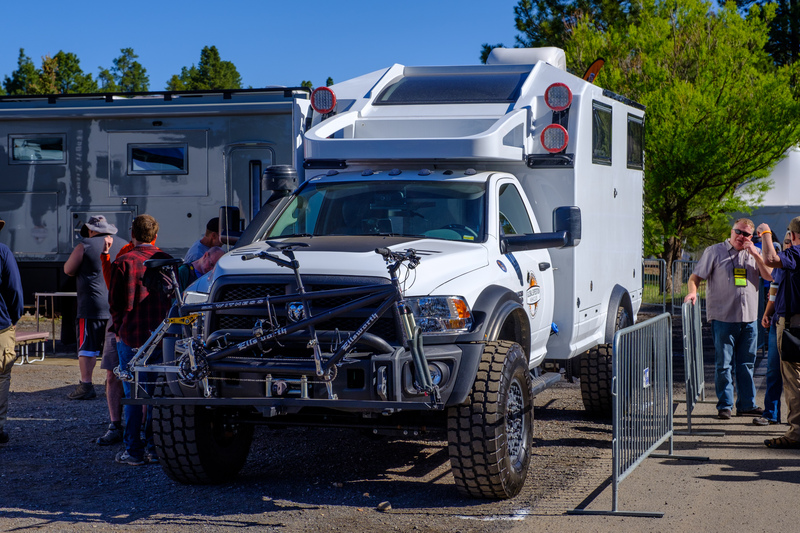 I mean they’ve always been the 800-pound gorilla at these events, but this new truck is absolutely mind blowing. 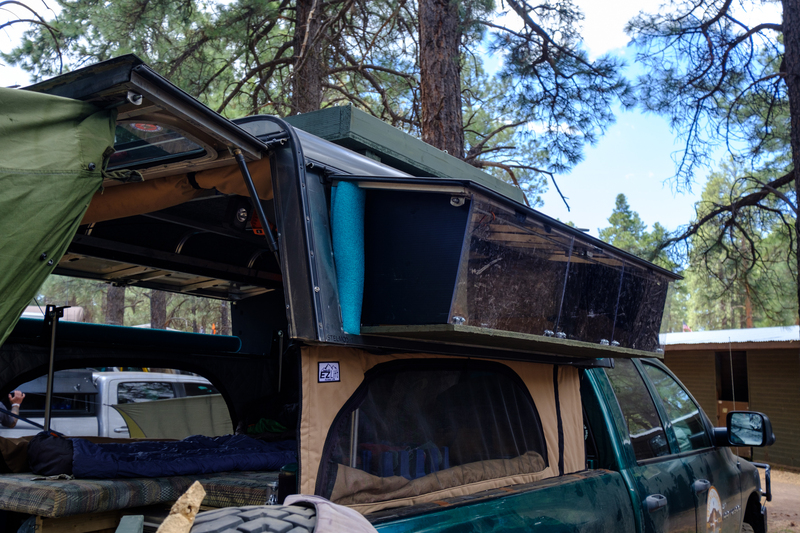 The scale of it really can’t be appreciated until you walk up next to it, and then have to lean back just to see the top. 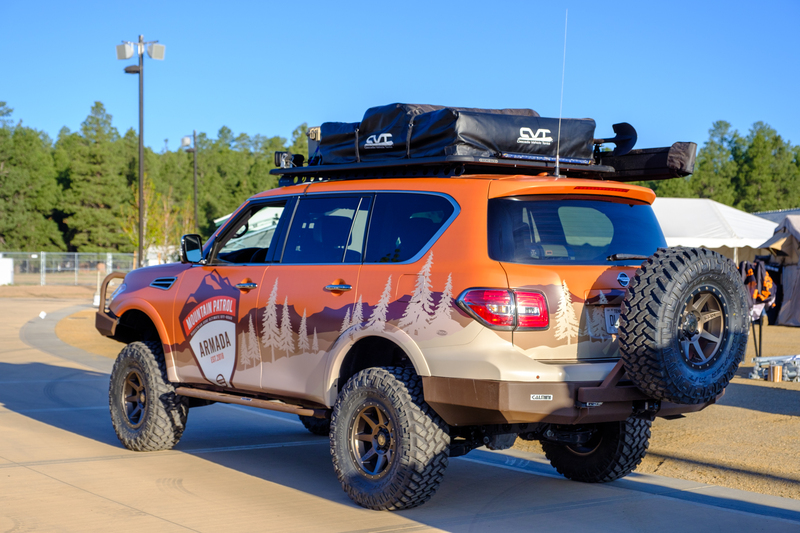 We’re hoping to see this thing out on a trail soon! 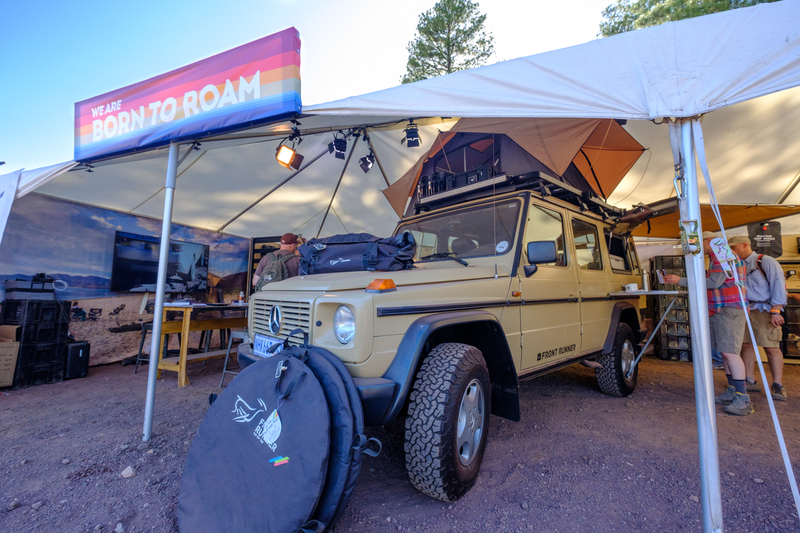 The new AT Overland Summit camper was looking good in the early hours of the event. 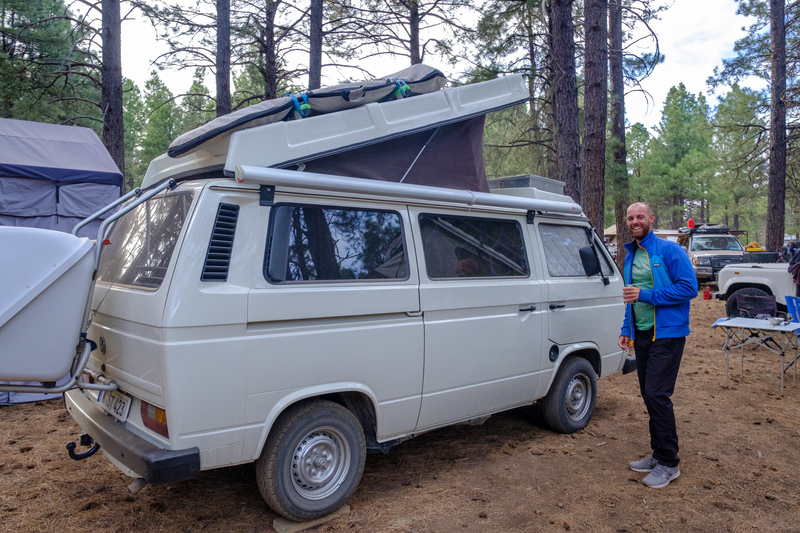 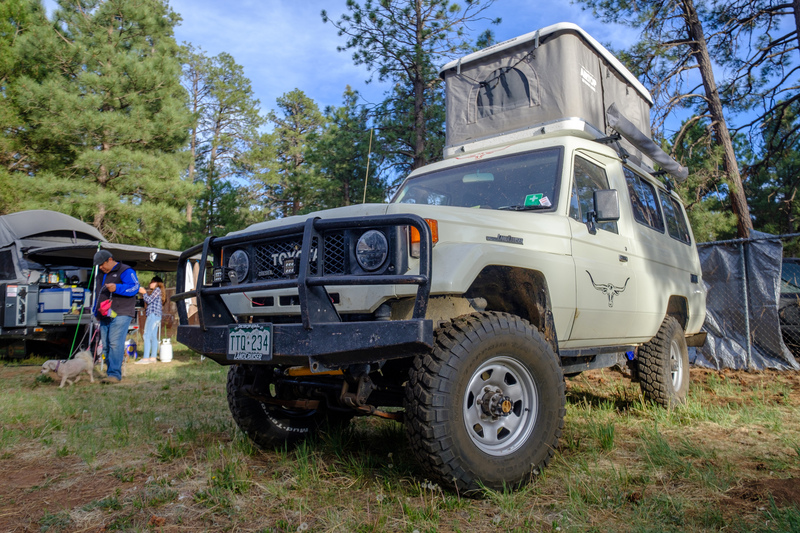 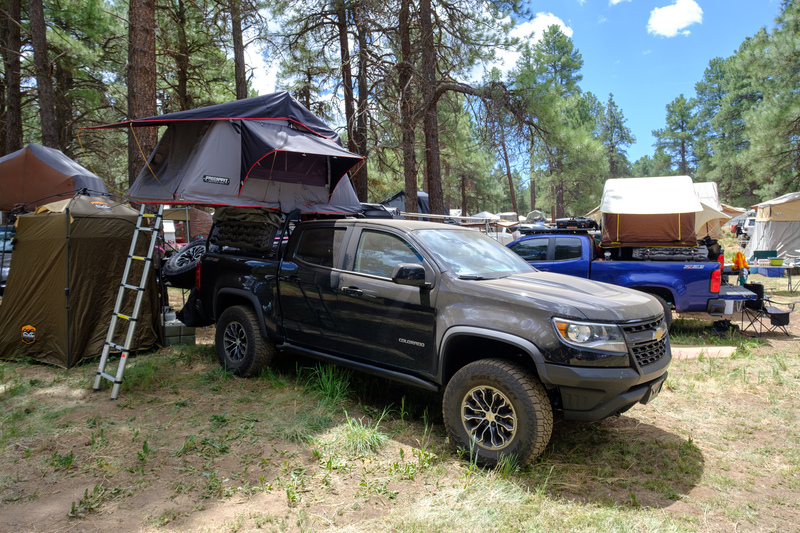 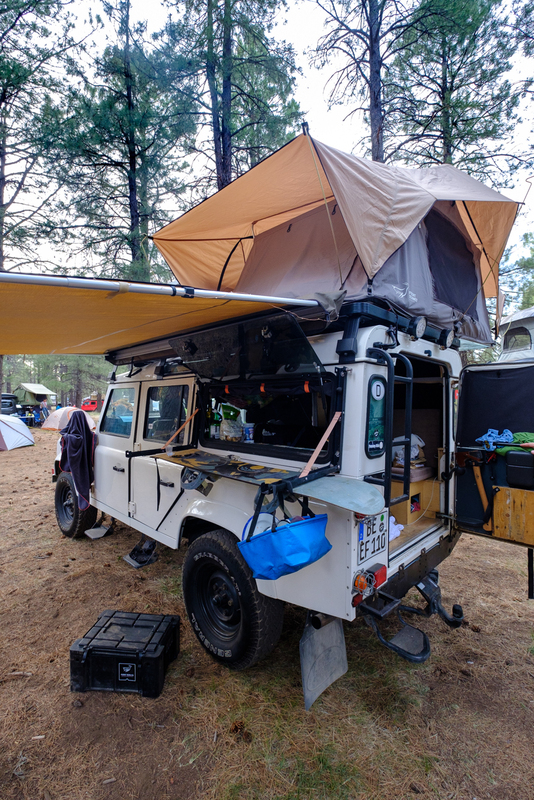 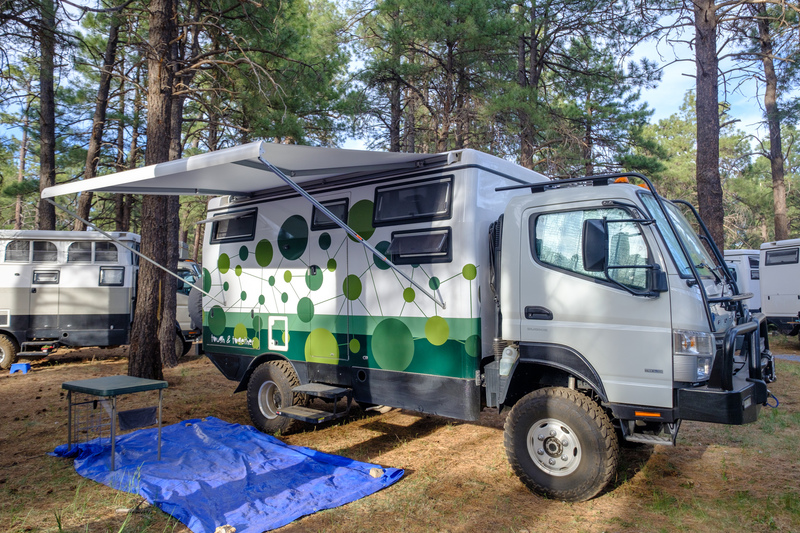 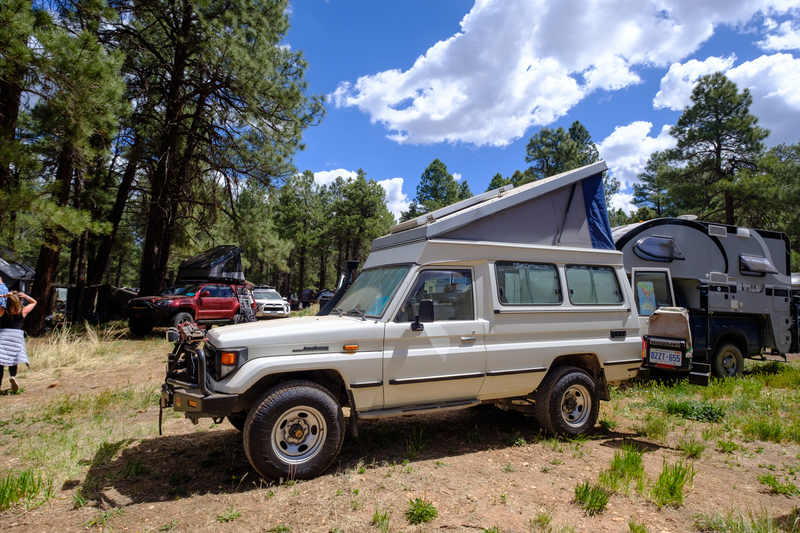 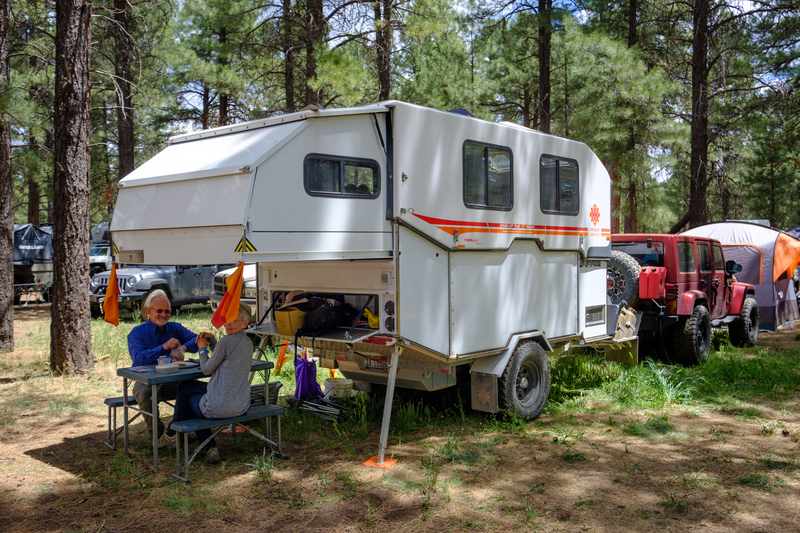 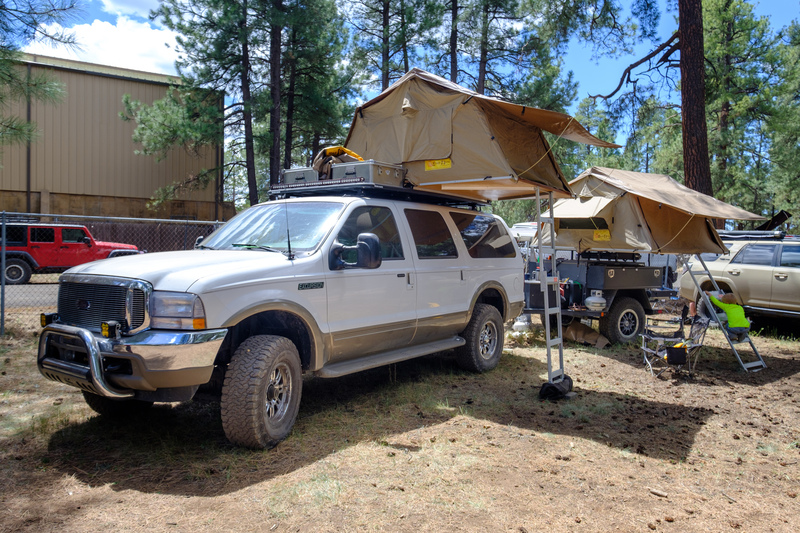 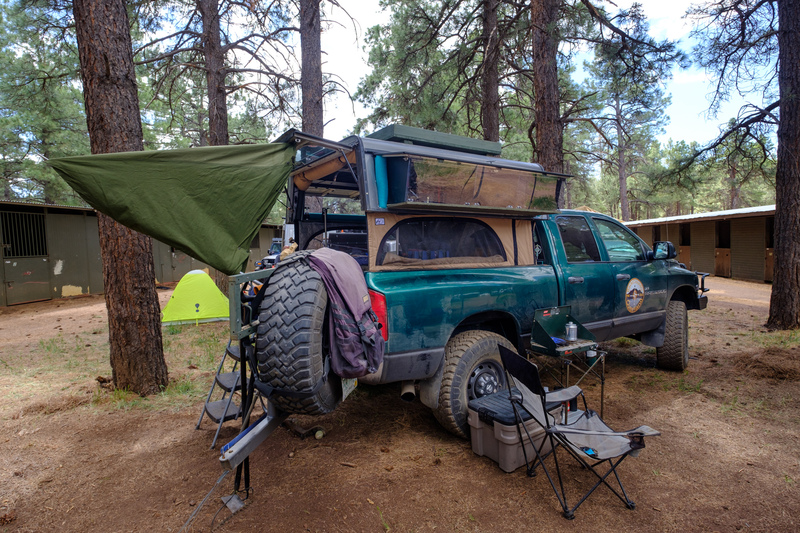 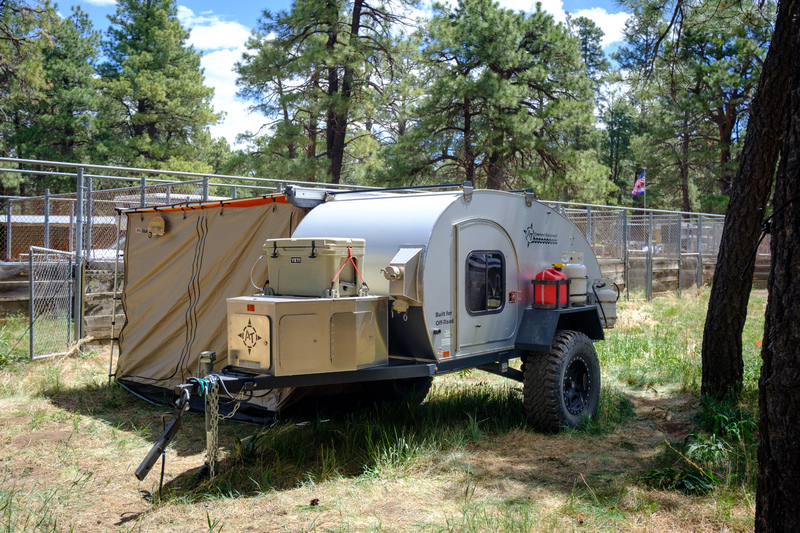 It was one of three new wedge-style campers we saw at Overland Expo, and the only one we were able to spend a night in during the weekend. 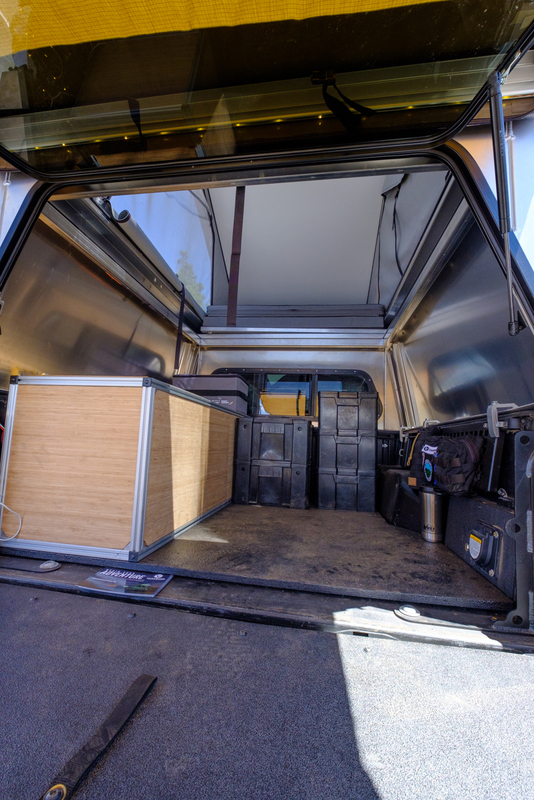 Hopefully, we can take a few days to evaluate the others in the near future. 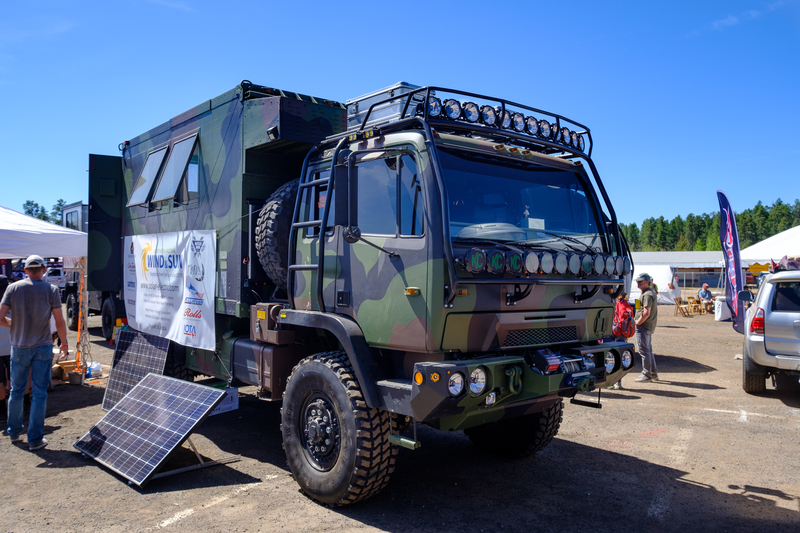 To read more about the Summit, check out our article here. 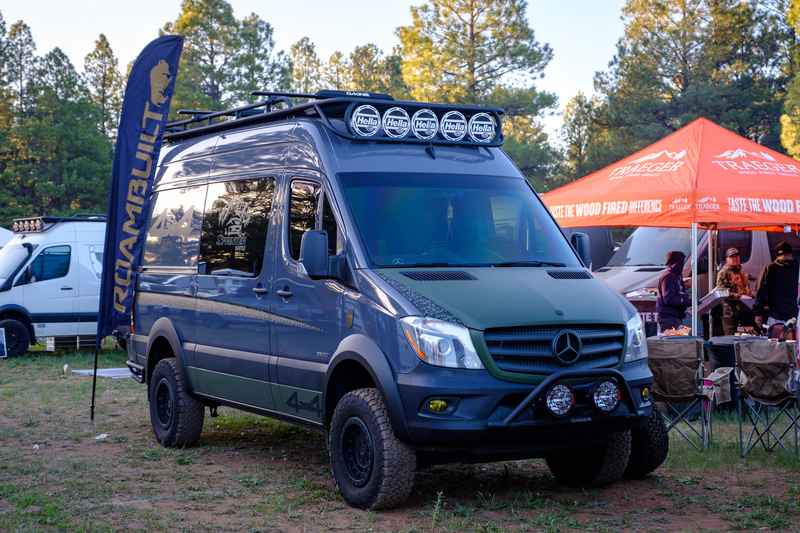 Speaking of rad new builds, Roambuilt had some of the coolest Sprinters at the event. 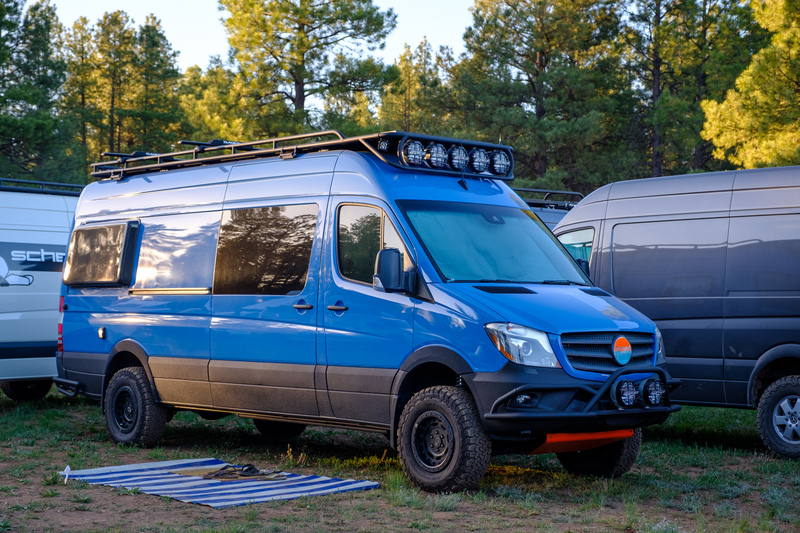 Their bumpers, racks, ladders, and steps were looking so good on these vans that we actually walked by most of them twice. 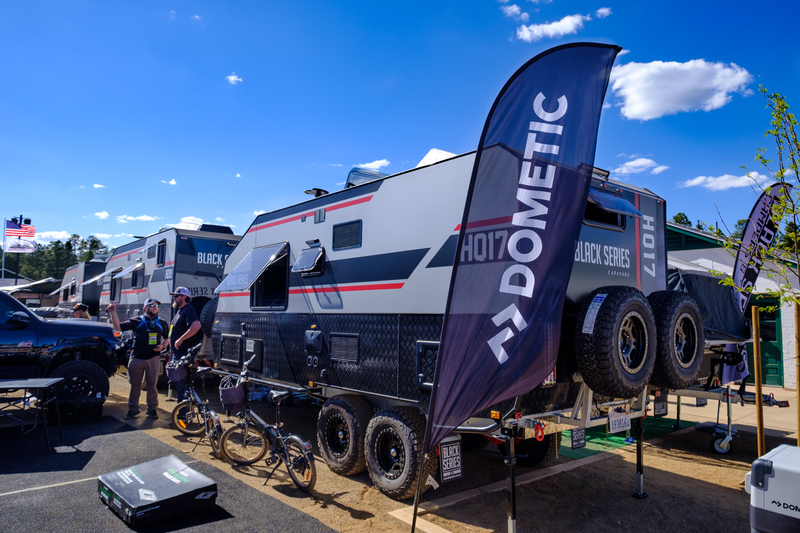 You can learn more about their products here. 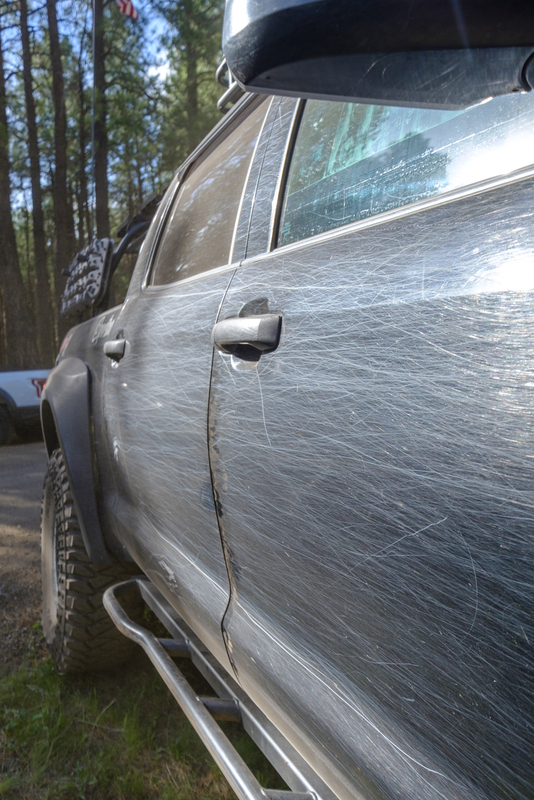 And the award for most pin-striping in history goes to….this Tundra! 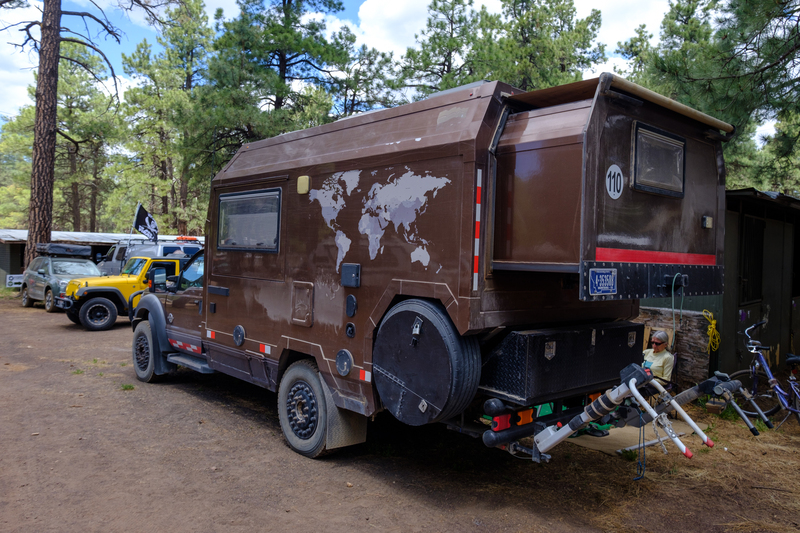 We don’t know where this thing has been, but it certainly left the trail wider than when it started! 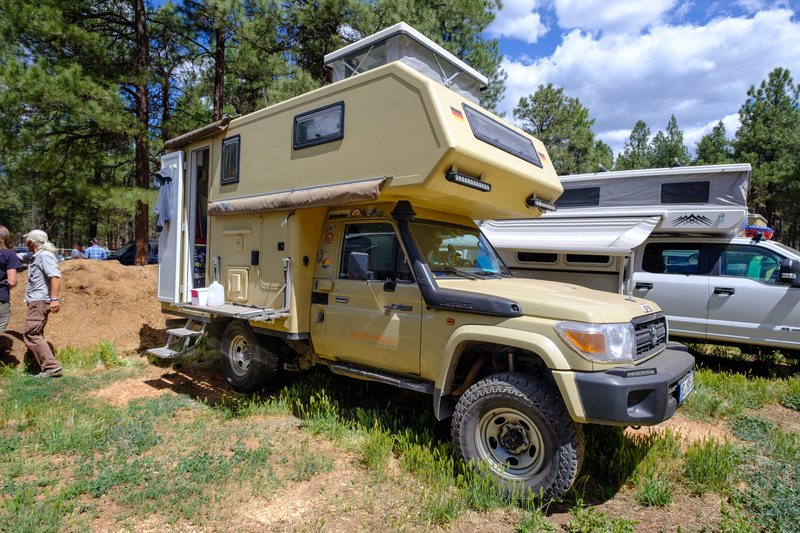 We recently wrote up a story on the Norweld/Main Line Overland Tacoma in Overland Journal, and this new tan version might be even cooler. 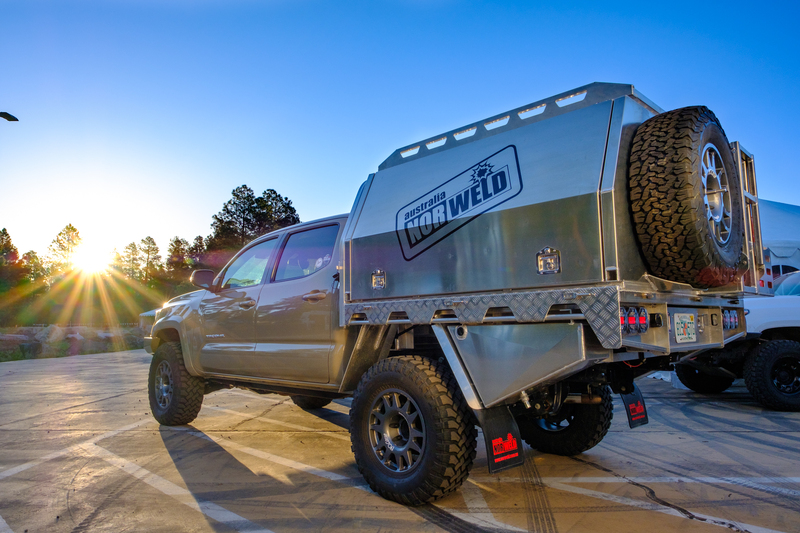 We’re loving the tray and canopy combo on the rear, and the Evo-Corse wheels and GTS suspension system balance it out perfectly. 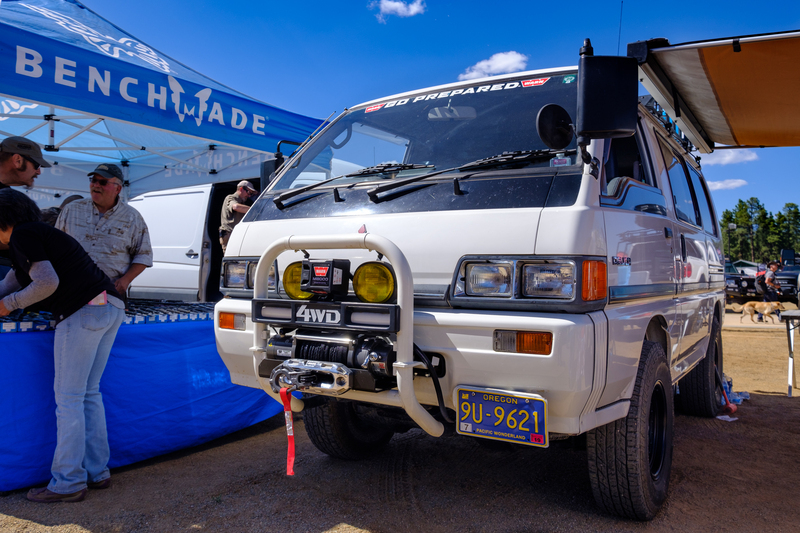 Per usual, the Maltec trucks were absolutely gorgeous. 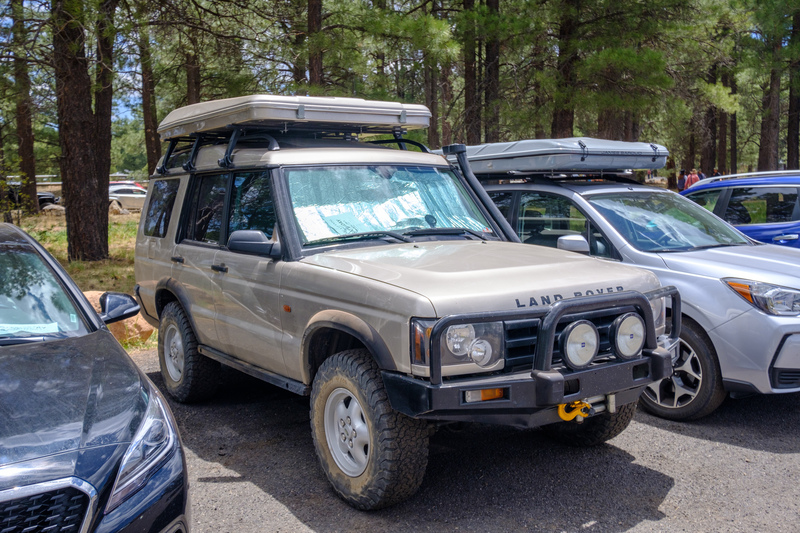 There were 70,80, and 200 Series Land Cruisers were scattered around their booth, and each one was worthy of its own independent feature. 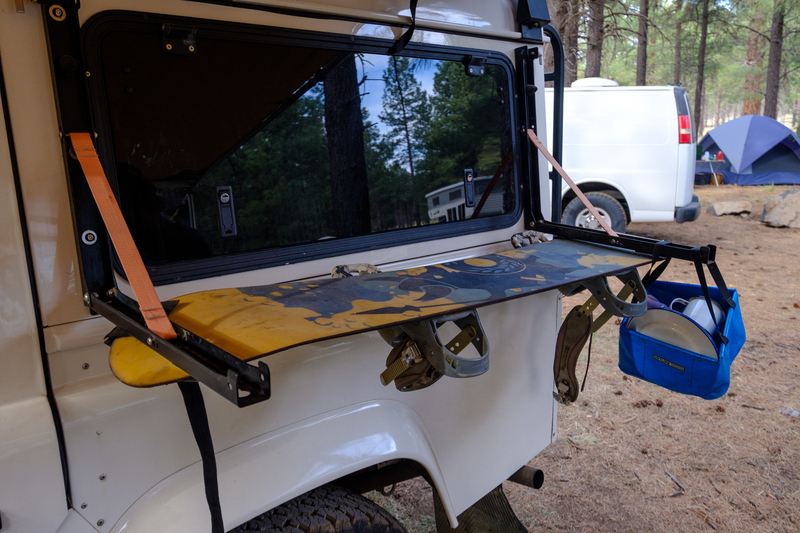 The most unique one was the Sack Wear edition, which sports a special white paint job, teak wood, and a matching custom surfboard. 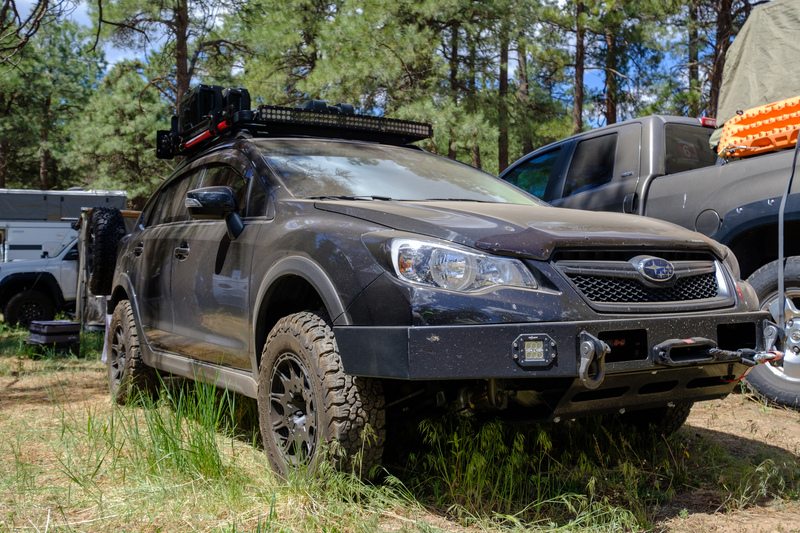 IT’S A COLORADO INVASION! 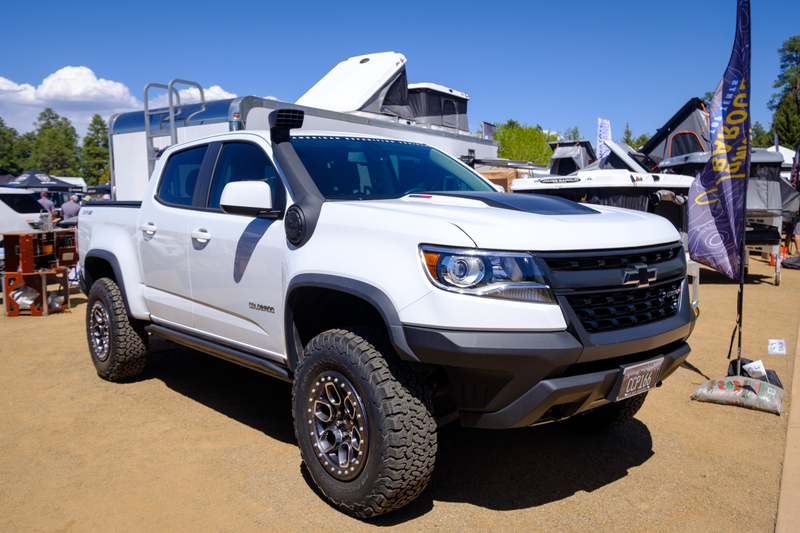 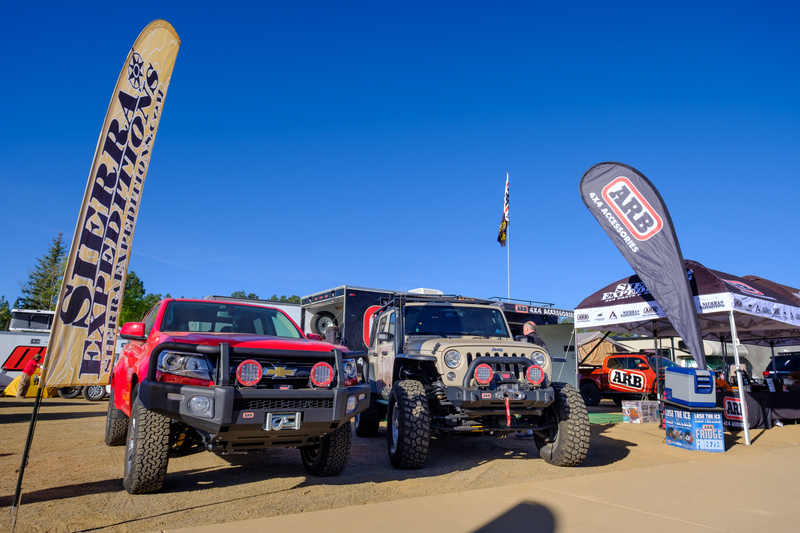 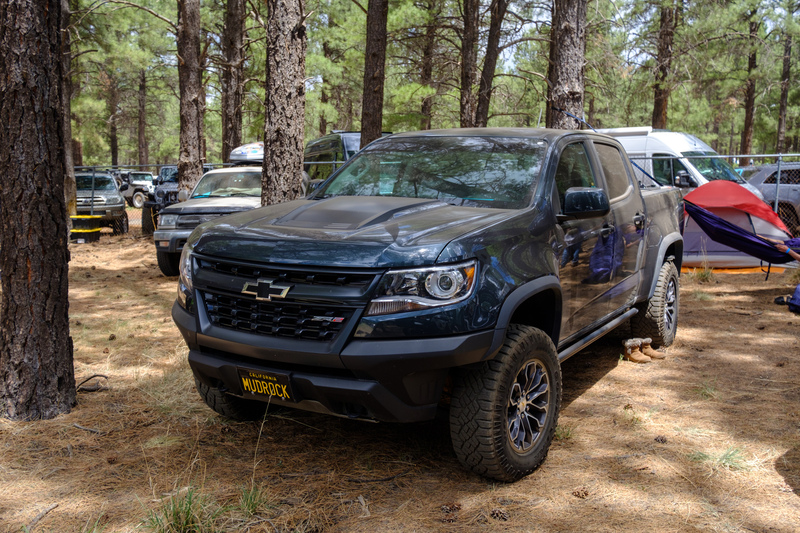 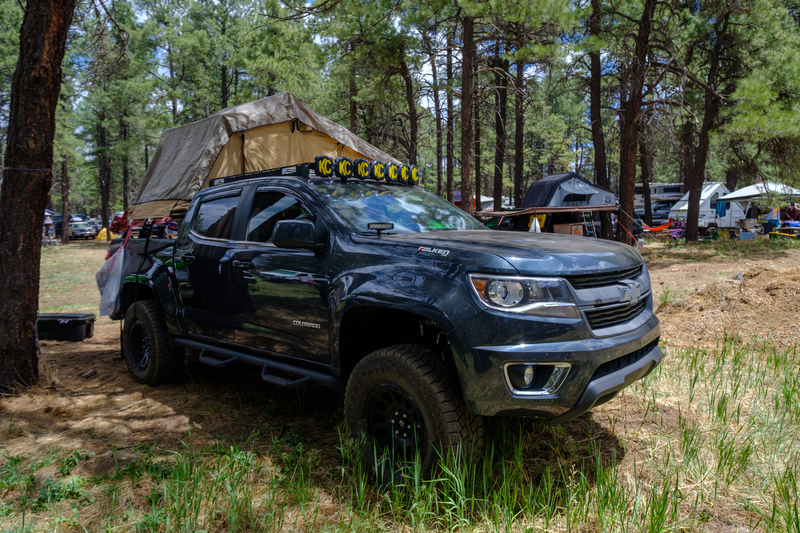 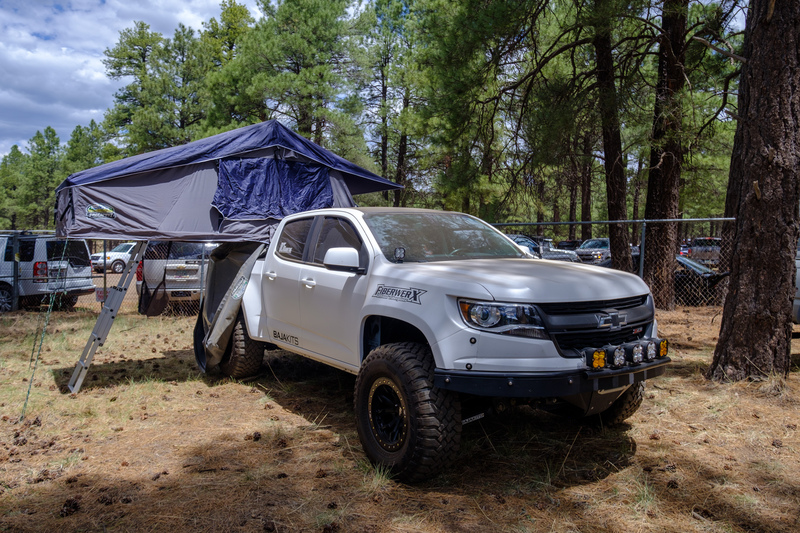 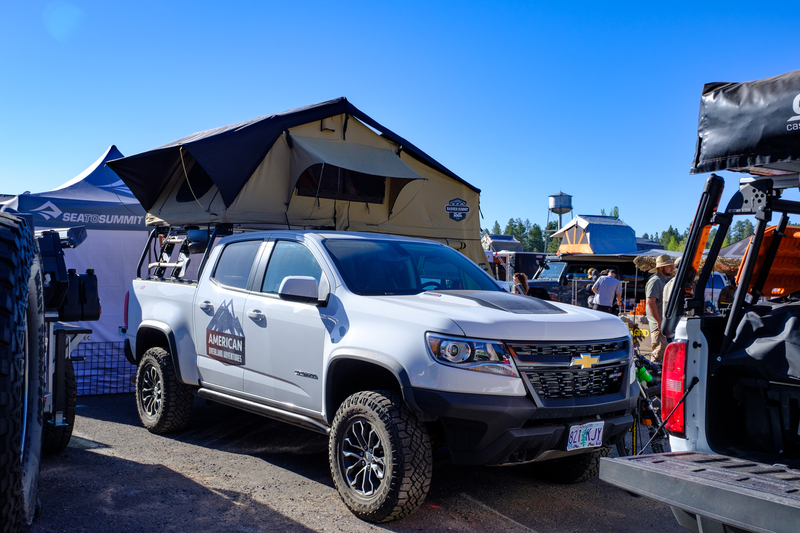 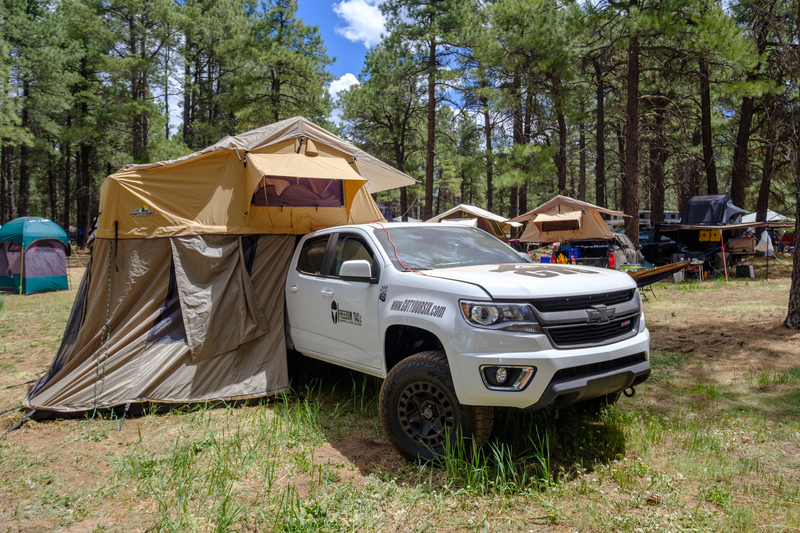 Be on a high alert, a large number of Chevy Colorados have been seen invading Overland Expo. 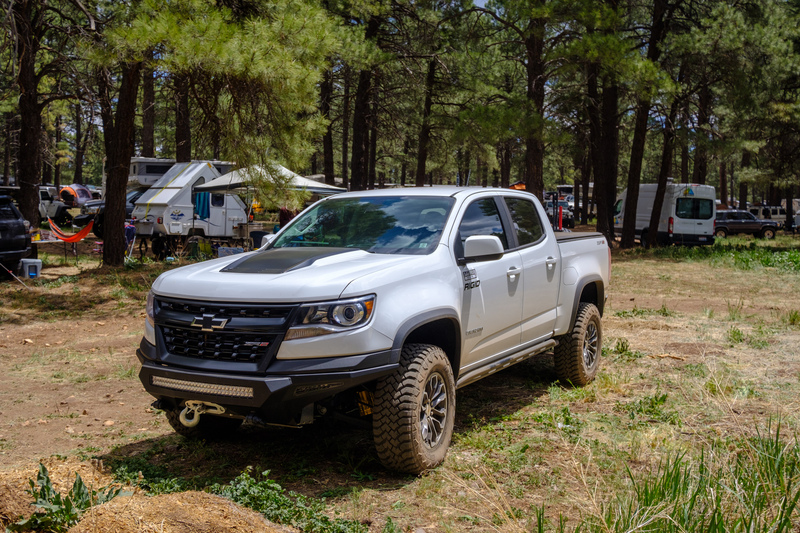 These well-built trucks are largely ZR2s with extremely happy owners and plenty of dust on the tires. 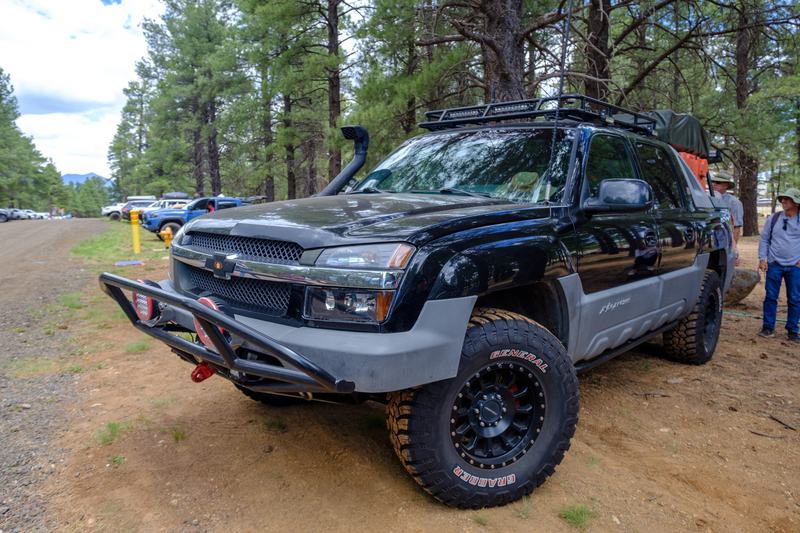 In all seriousness, we were thrilled to see so many ZR2s at the show. 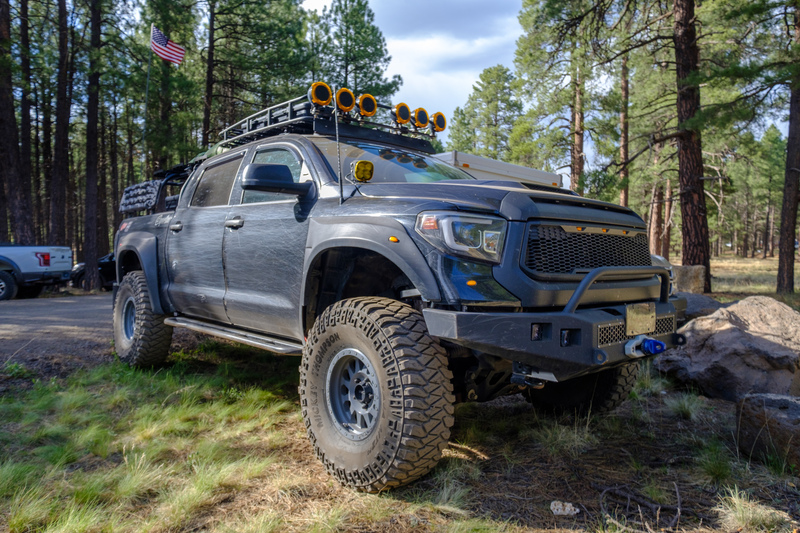 With front and rear lockers, amazing suspensions, and skid plates and sliders from the factory, we’re not exactly surprised to see their numbers increasing, but, I bet more than a few Tacoma owners were. 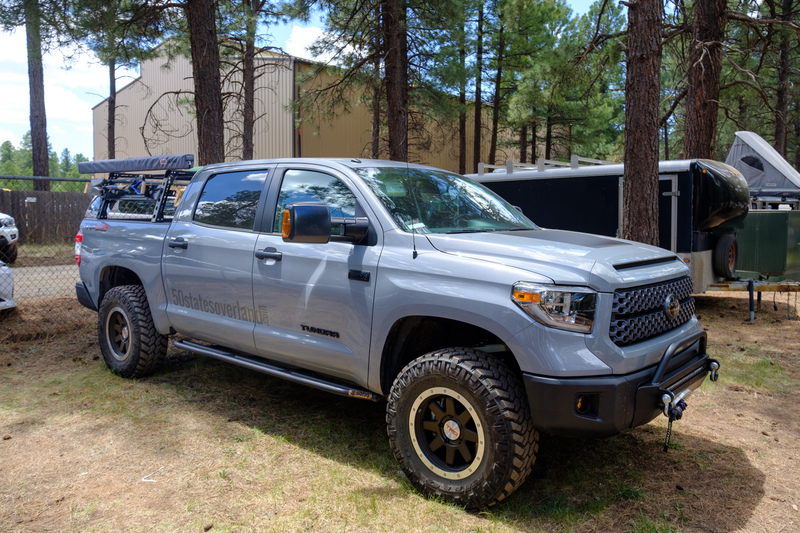 We saw a lot of capable and luxurious trailers at the event, and several newcomers to the market. 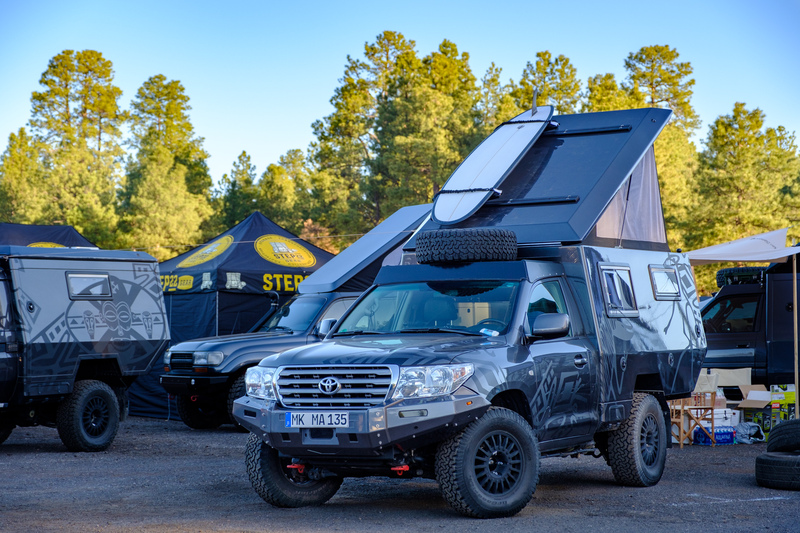 Two of the largest were Black Series Campers, and Kimberly Kampers from Australia. 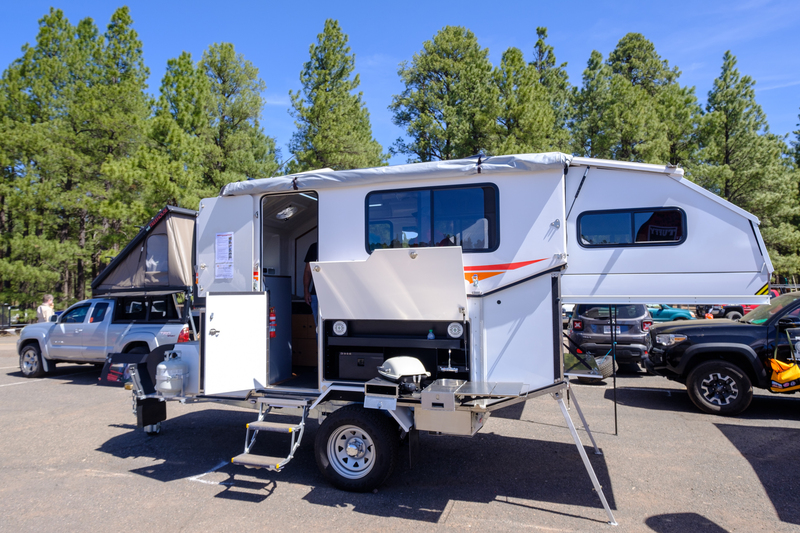 The Kimberly takes a lightweight approach and is well known for their excellent build quality and towing characteristics. 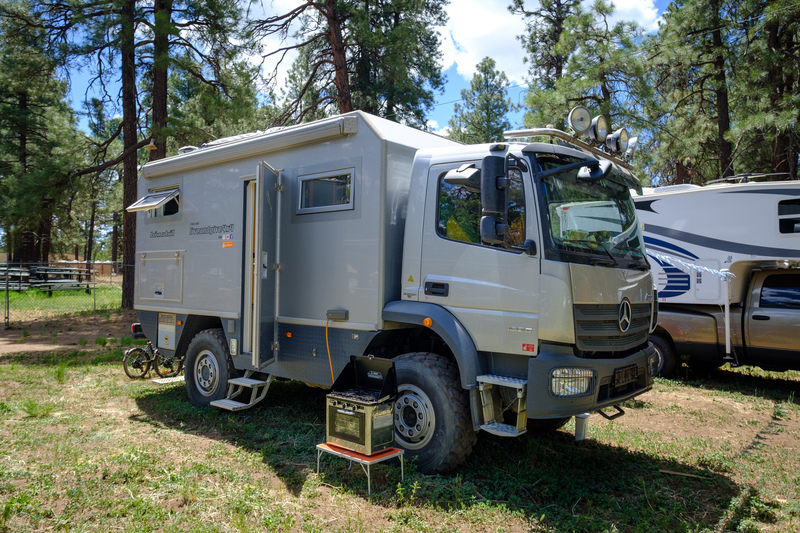 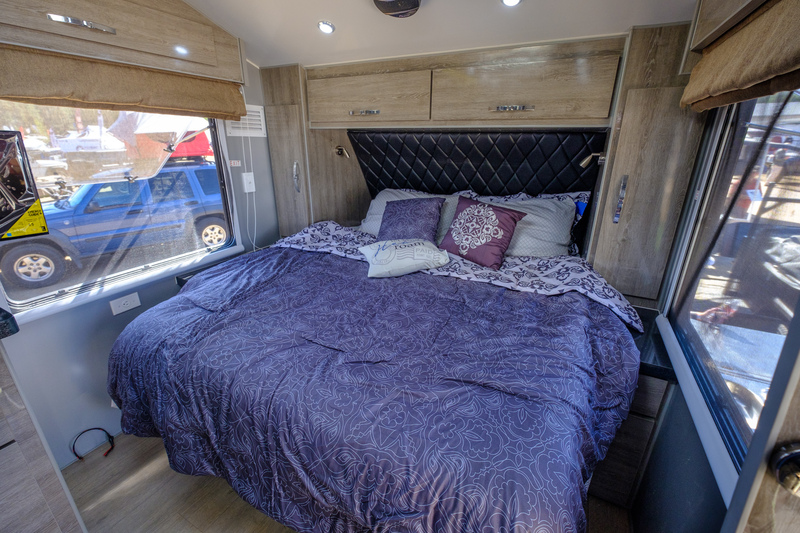 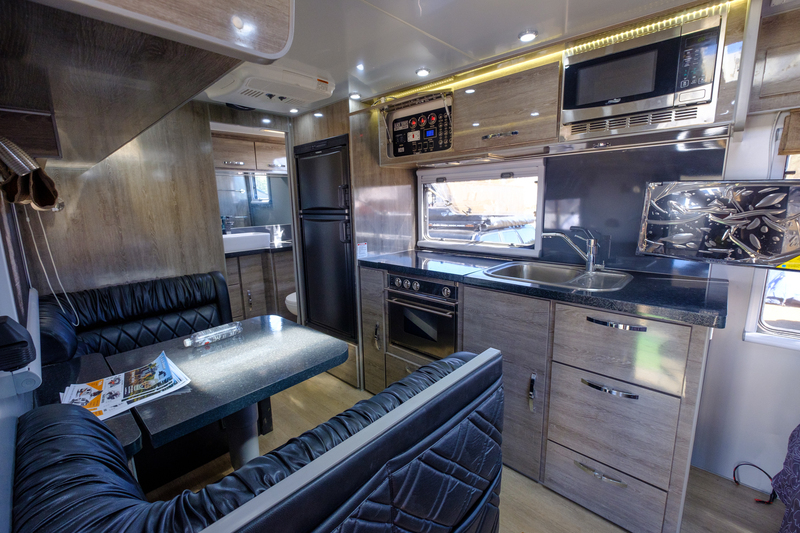 The Black Series Campers offer more space and a cheaper price point, but at the cost of a heavier total weight. 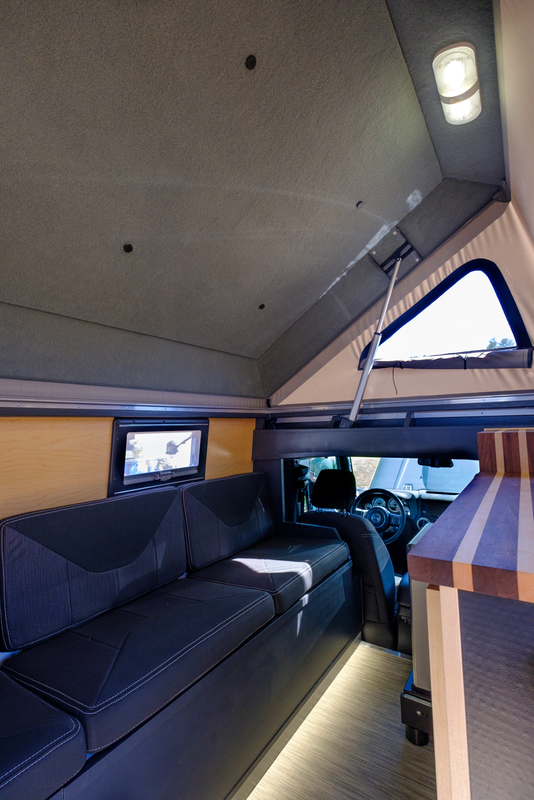 We enjoyed looking at both thoroughly, and plan to feature them in greater detail as soon as possible. 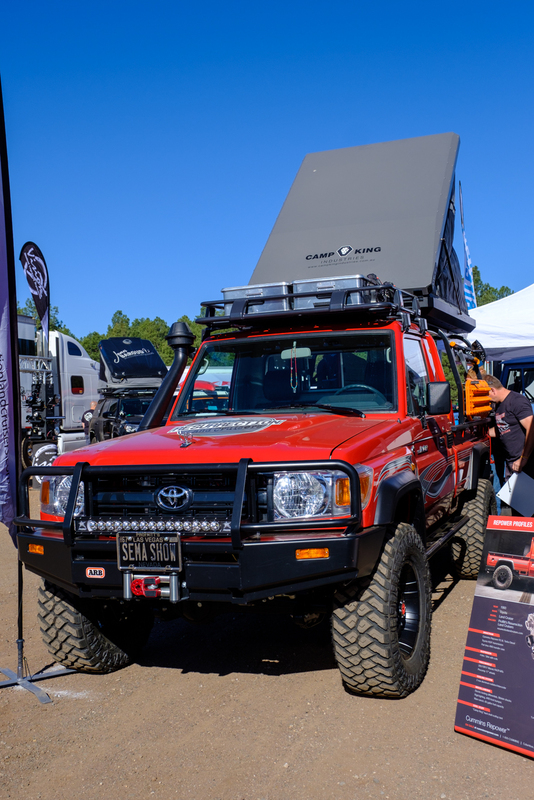 One of my favorite parts of Overland Expo is meeting the travelers. 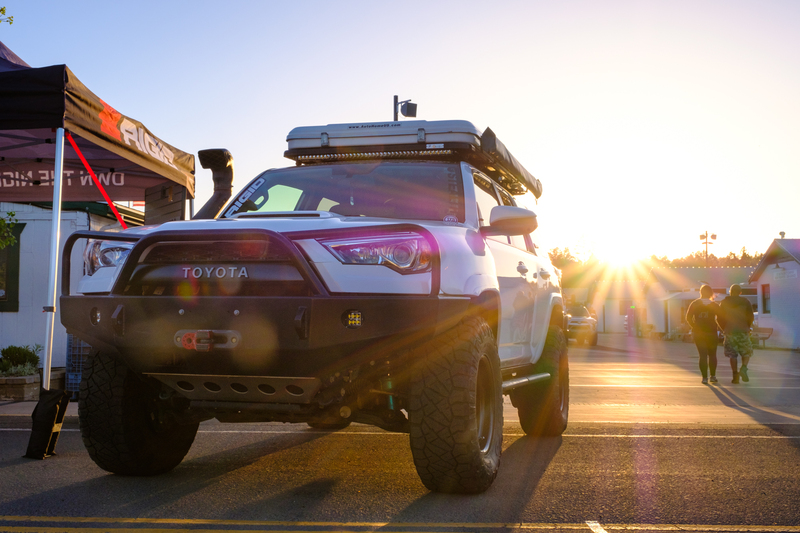 Not only are their vehicles fascinating, but the people are always inspiring and friendly. 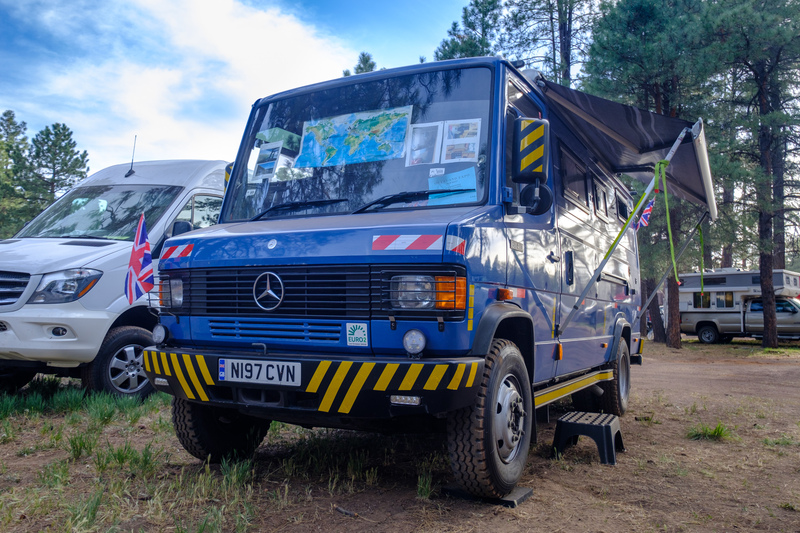 If you aren’t walking around the campgrounds and meeting these wonderful overlanders, you’re missing out on more than I can possibly explain. 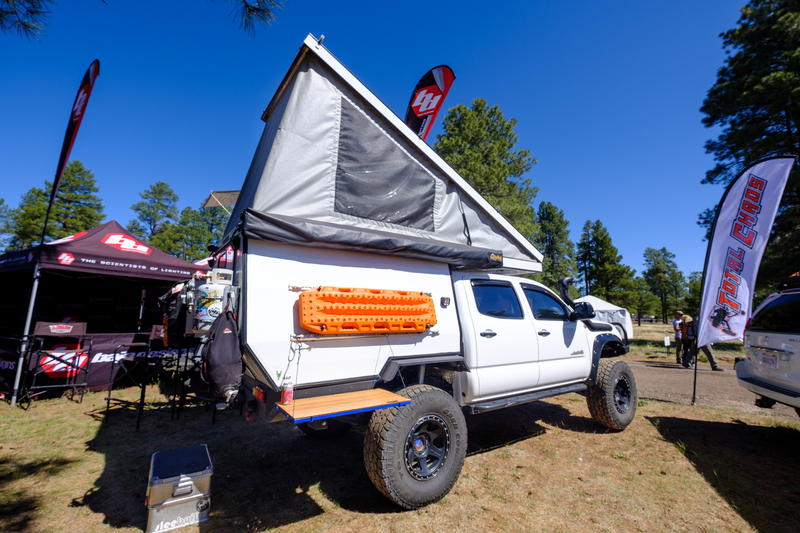 If there was one wedge-style camper that dominated the event, it was the Go Fast. 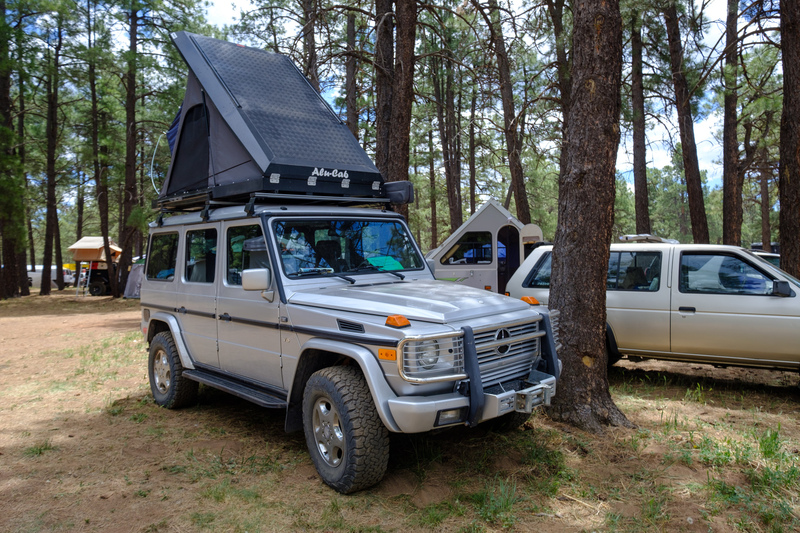 These light and affordable tent/shell combos were popping up everywhere, and people were definitely talking about it. 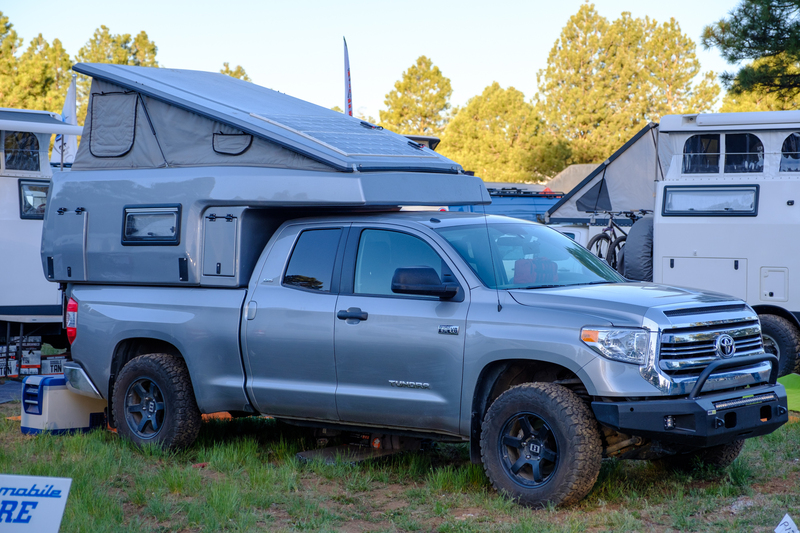 We particularly liked this Tacoma, and Desk to Glory’s Tundra build. 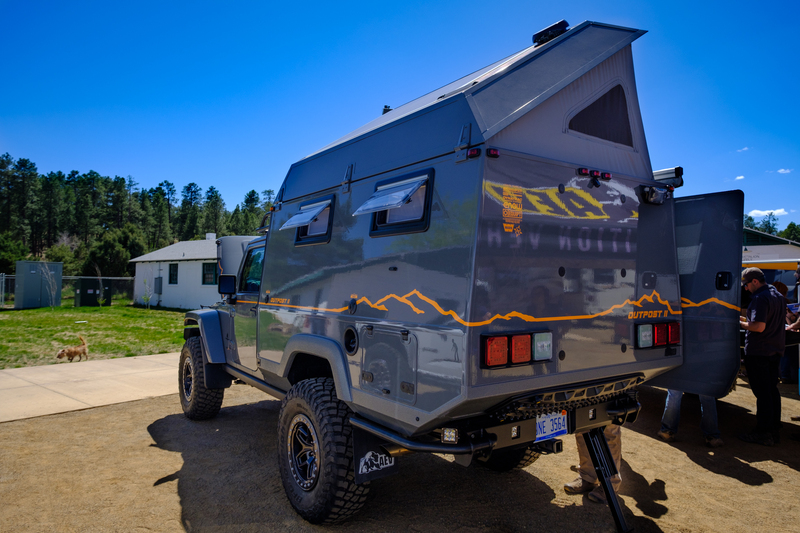 To learn more, check out their website here. 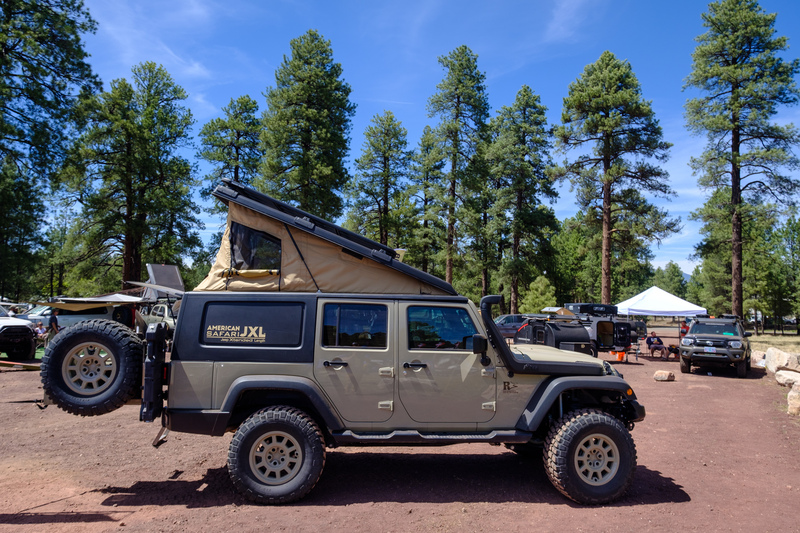 Most of the Jeep builds seem to focus on four-door JKs and JLs in the overland world, but I have to say that I’m in love with this two-door model built by Hatchet the Jeep and Goose Gear. 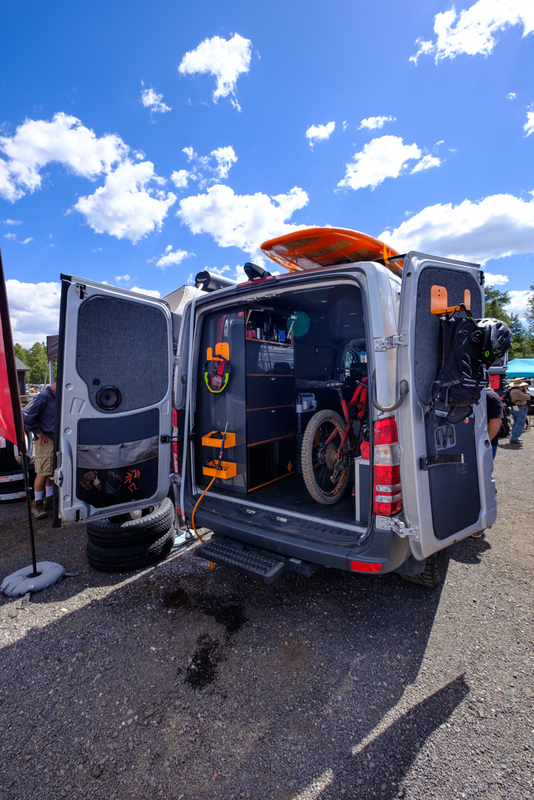 It looks great, has plenty of storage space for your gear, and is small enough to take you wherever you want to go. 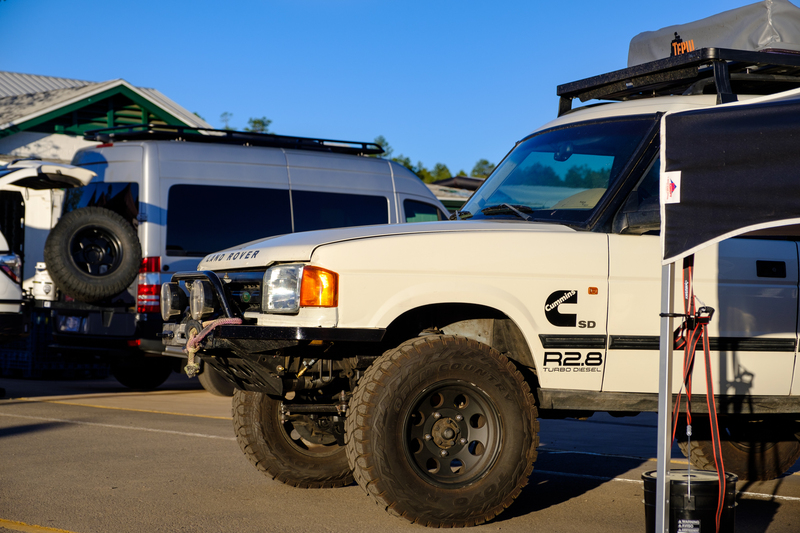 Nissan has been a big 4×4 player overseas for some time, but they haven’t had as much traction here in the States with overlanders. 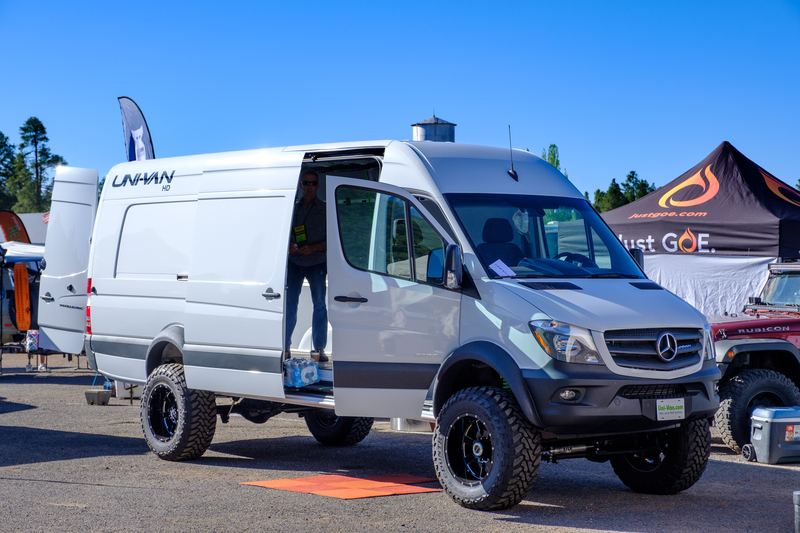 That’s all changing though, as the company is paying serious attention to the needs of the four-wheel drive market in North America. 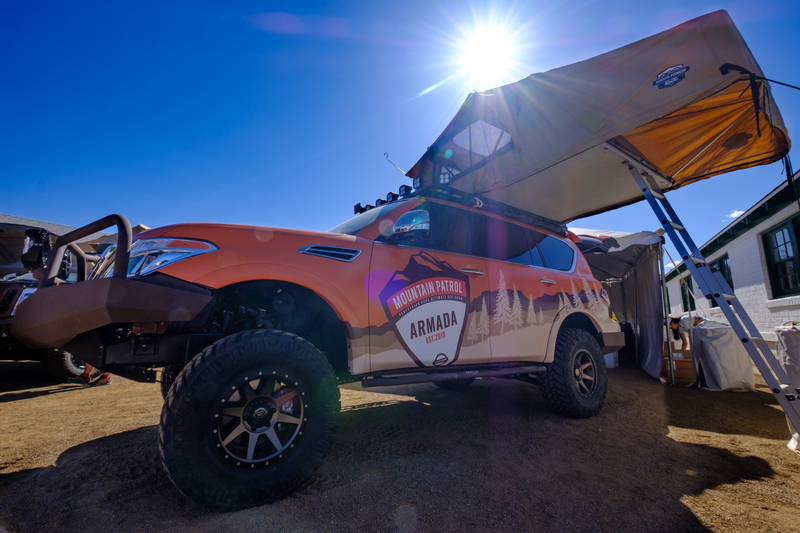 Their diesel trucks with factory ICON suspensions were a start, and now they’re showcasing an Armada, the Patrol everywhere else, with a full array of off-road touring equipment. 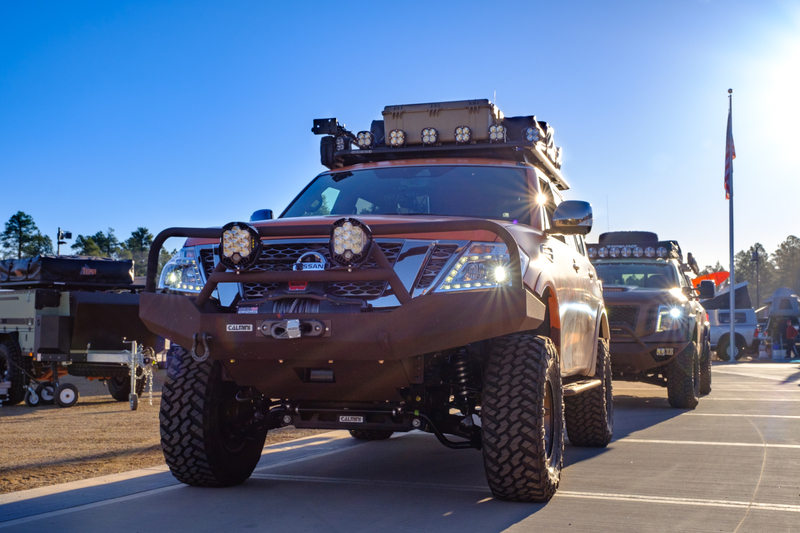 Both the Titan and Armada shown above looked great, and we’re excited to see what the company does next! 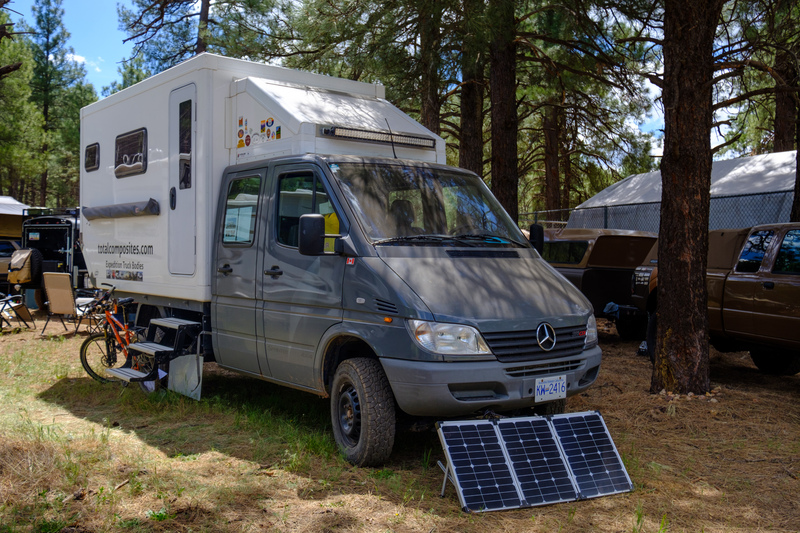 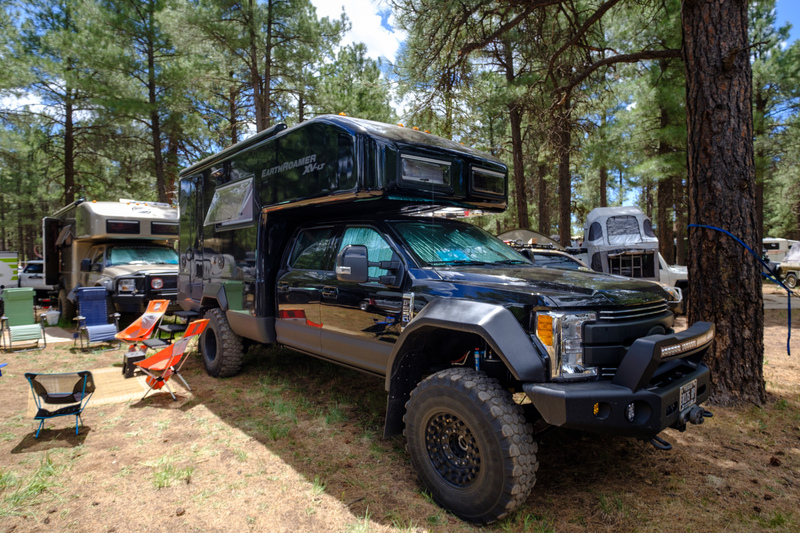 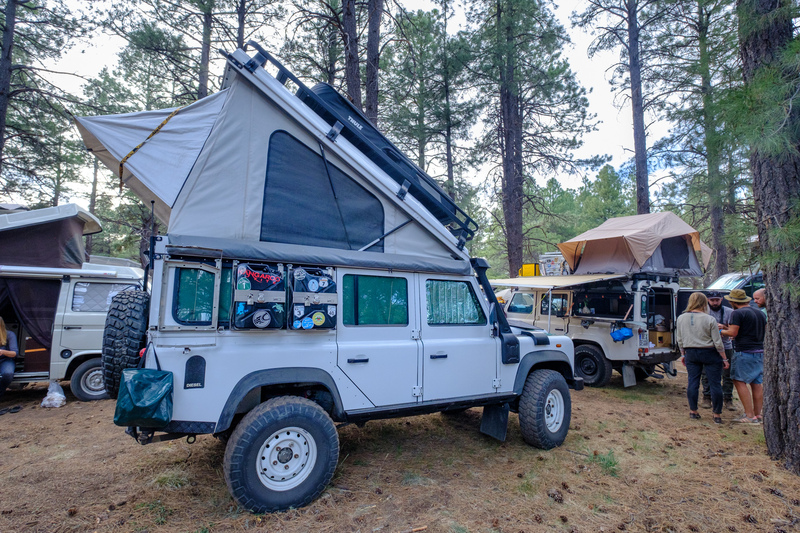 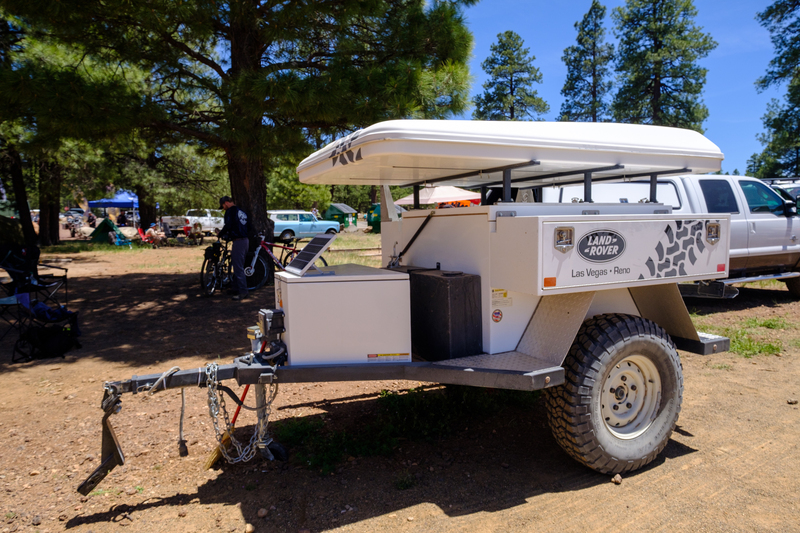 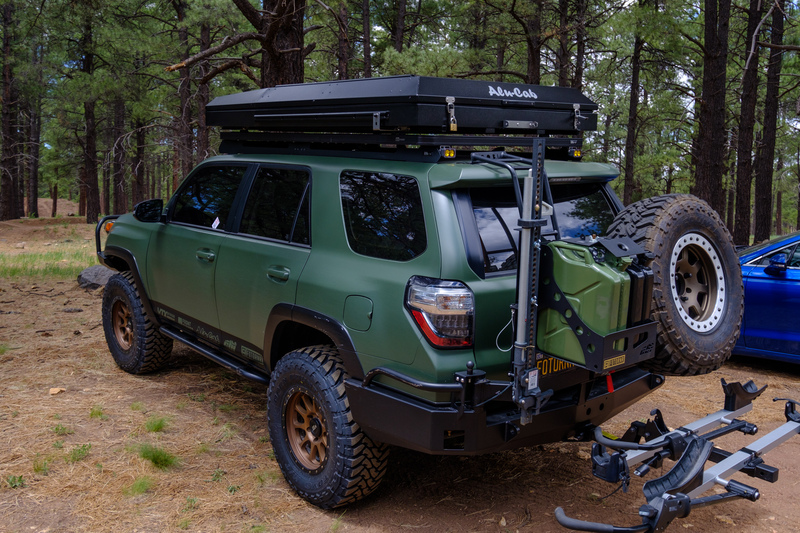 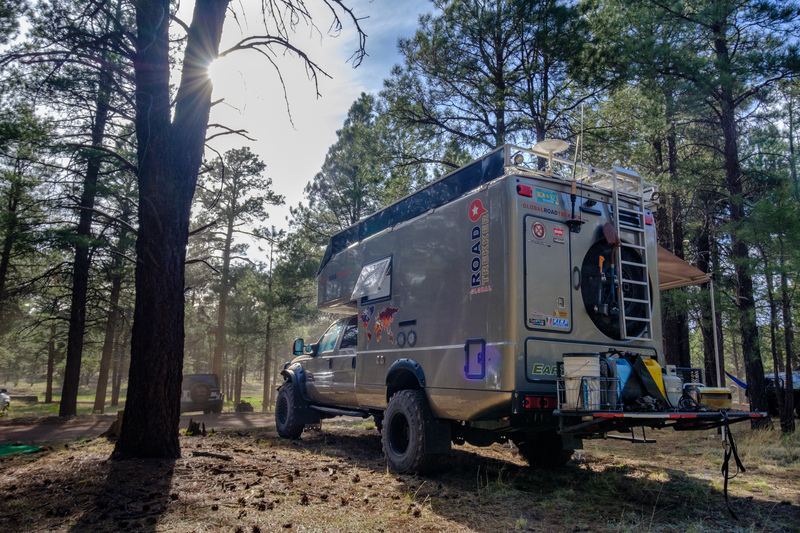 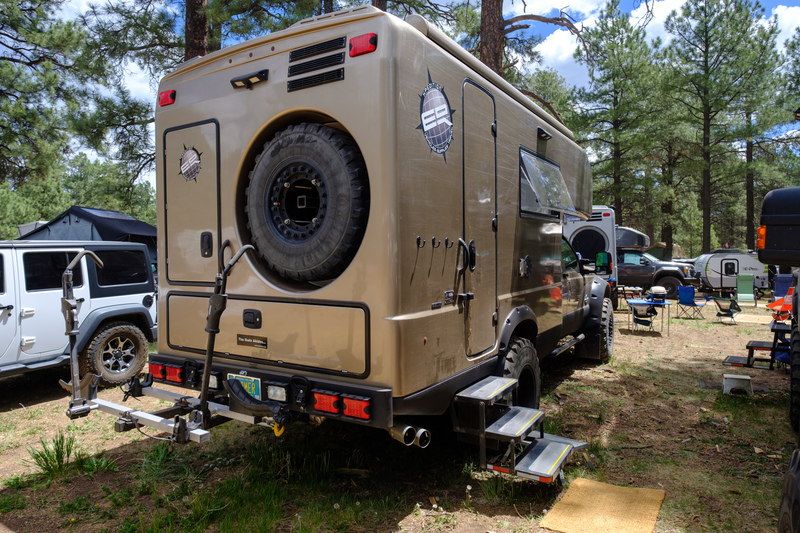 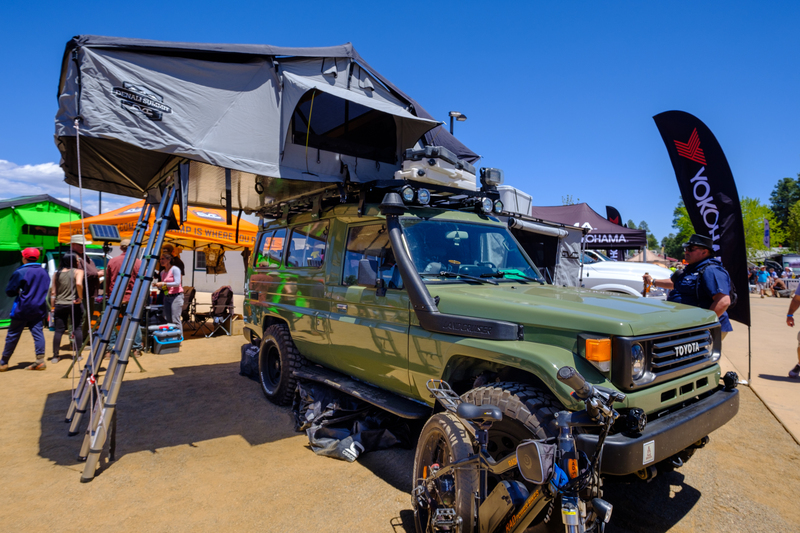 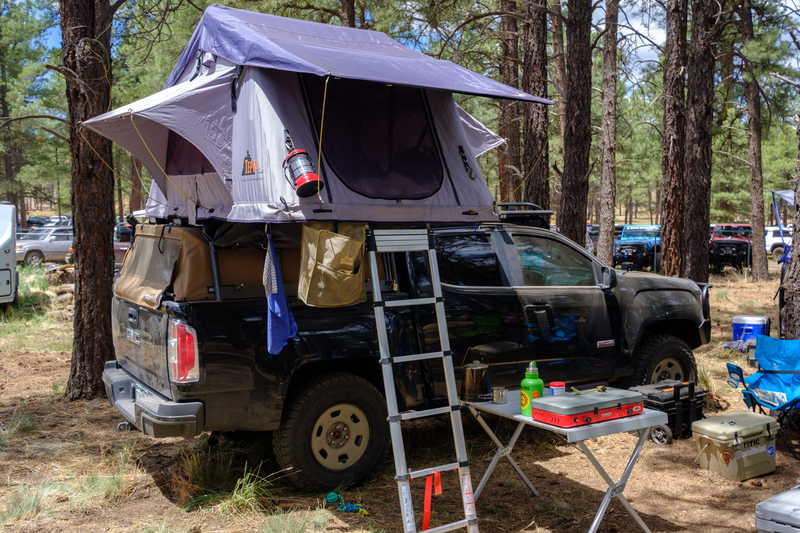 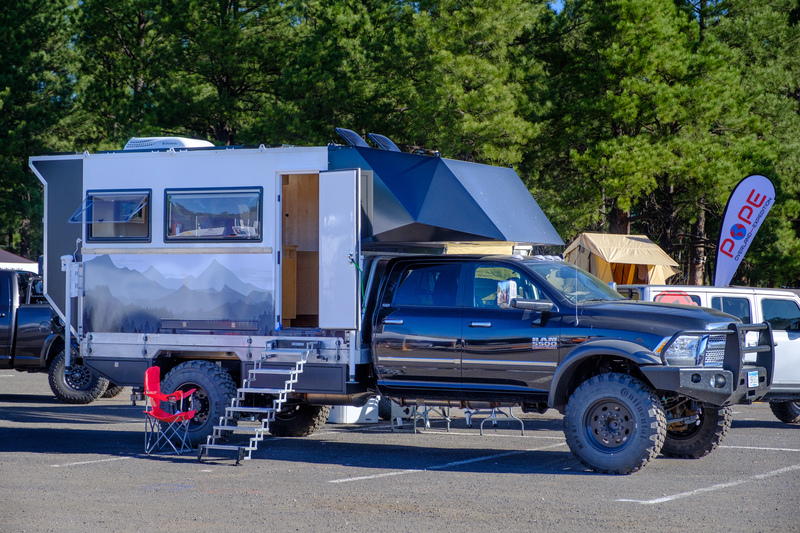 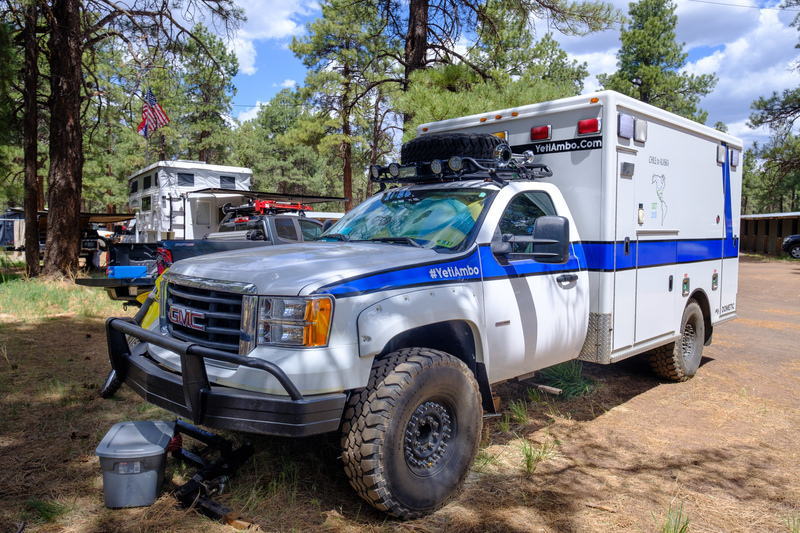 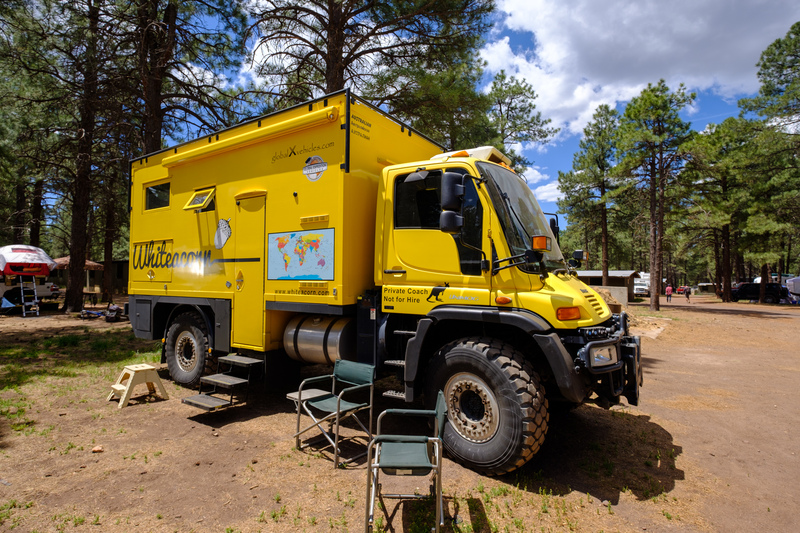 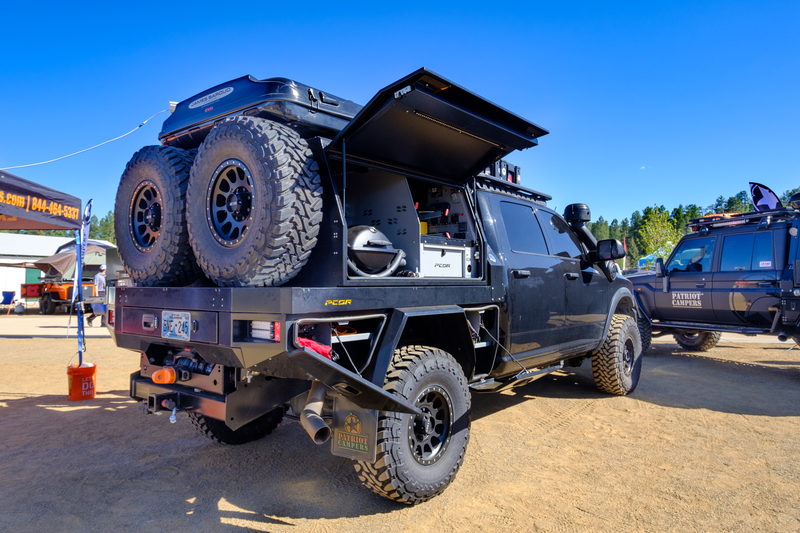 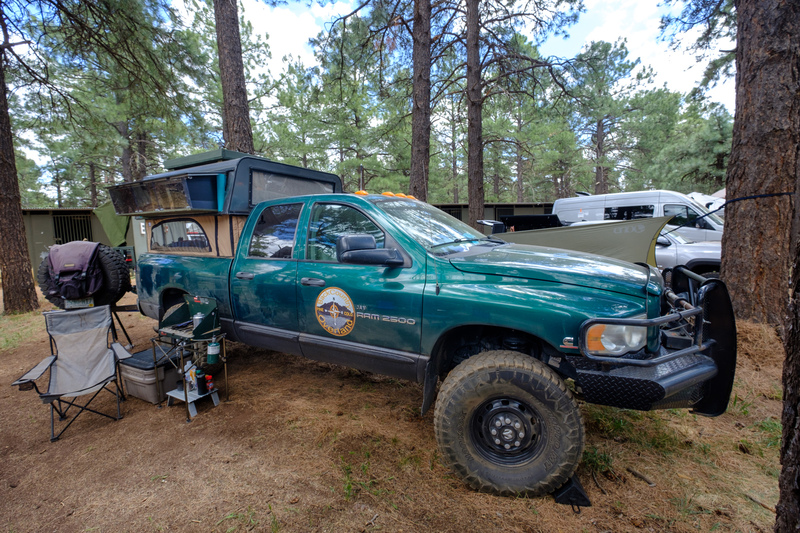 There are so many creative solutions on vehicles at Overland Expo that it’s easy to miss most of them, but this one did manage to catch my eye. 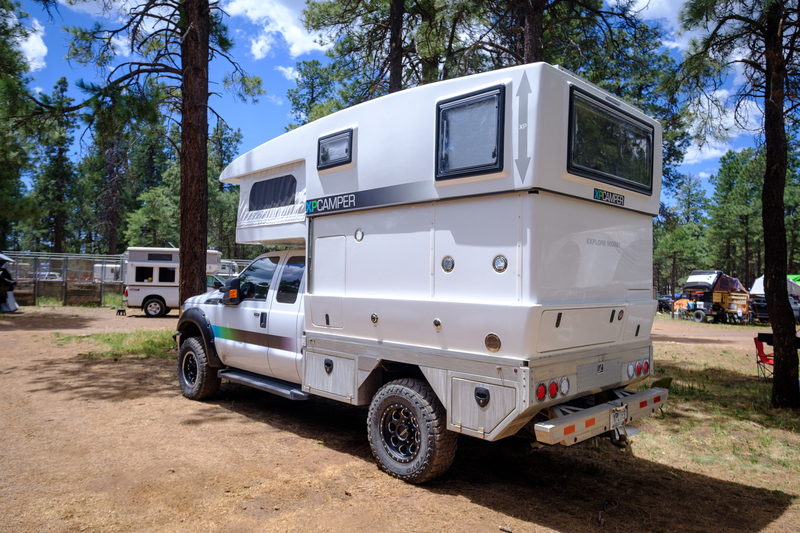 It’s a camper shell that not only lifts up with tent walls, but also has fold-out windows with shelves for storage. 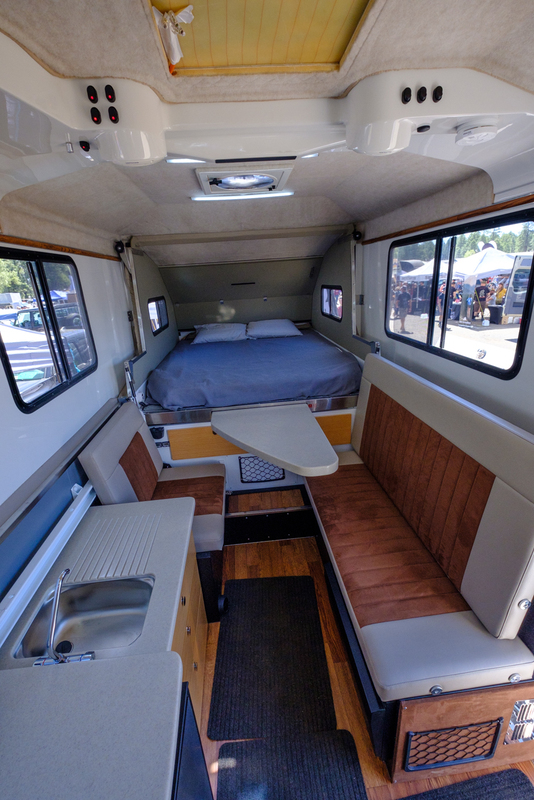 It looks pretty darn comfortable! 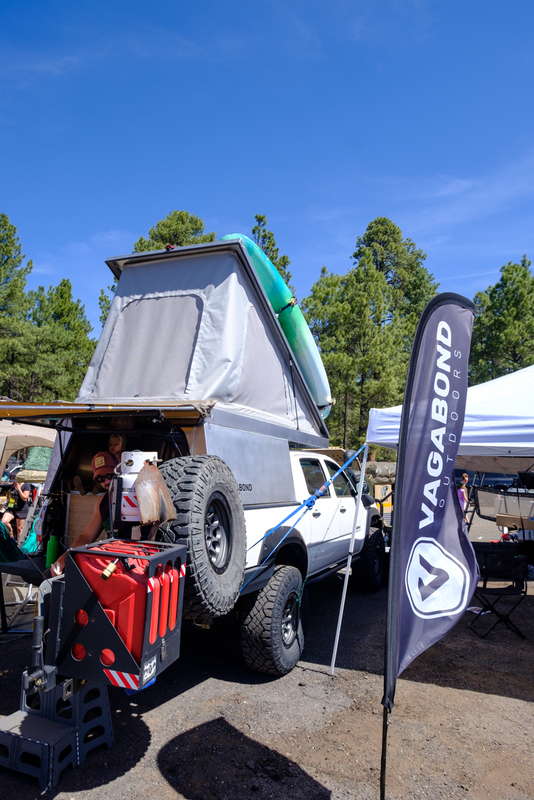 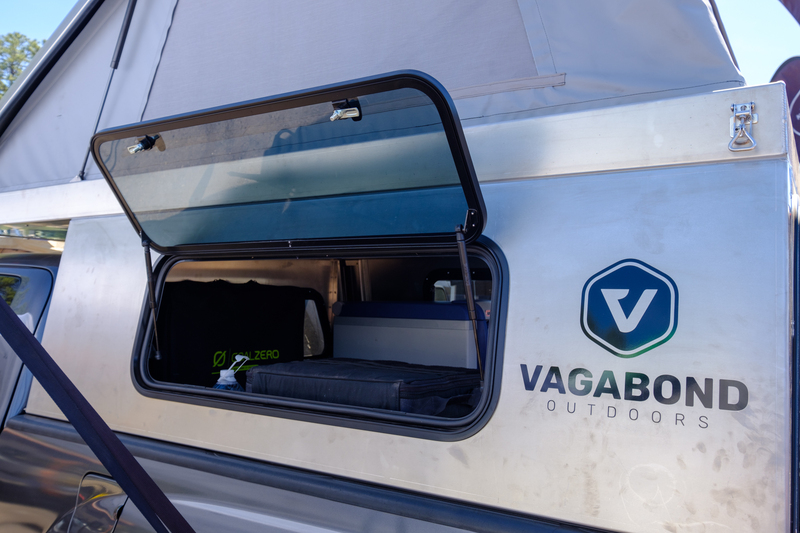 The final wedge-style camper shell at the event was from Vagabond Outdoors, and it’s called the drifter. 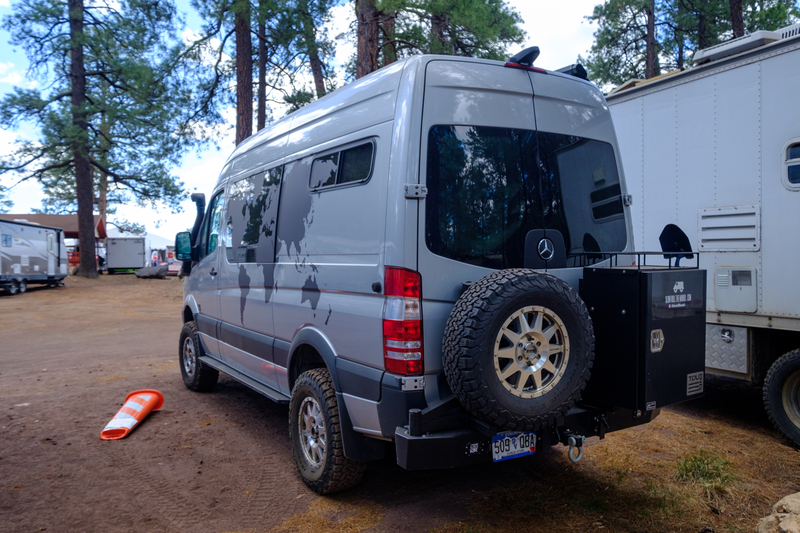 We wrote up a story on it here, and really enjoyed seeing the product in person. 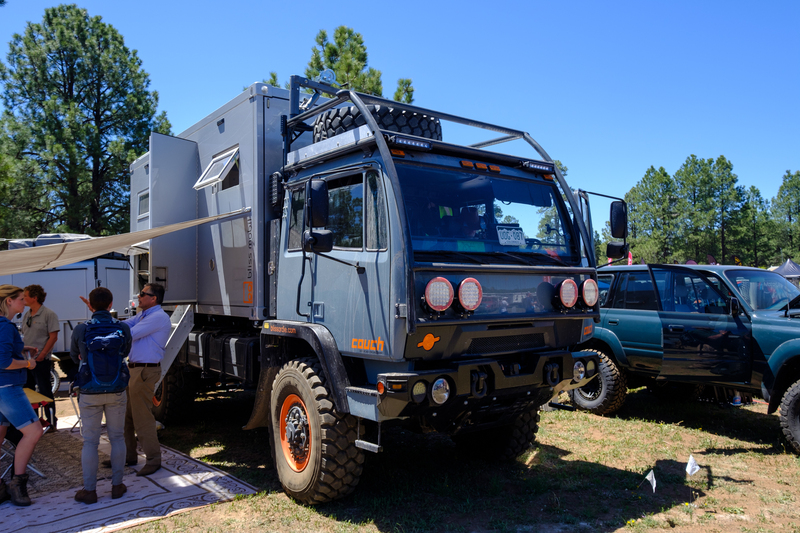 It certainly looks like a high-quality piece of kit, and we’re hoping to test one out in the future. 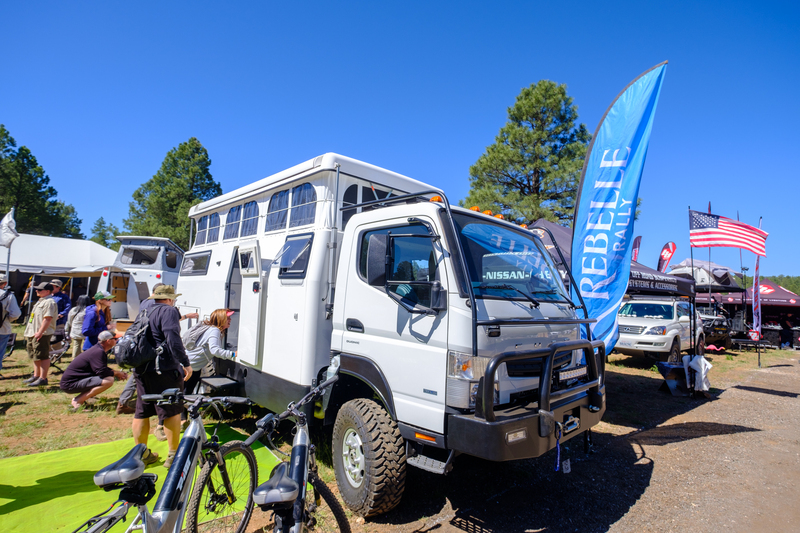 There were a ton of Earth Cruisers at the event this year, and that seems appropriate given that the company is celebrating their 10-year anniversary. 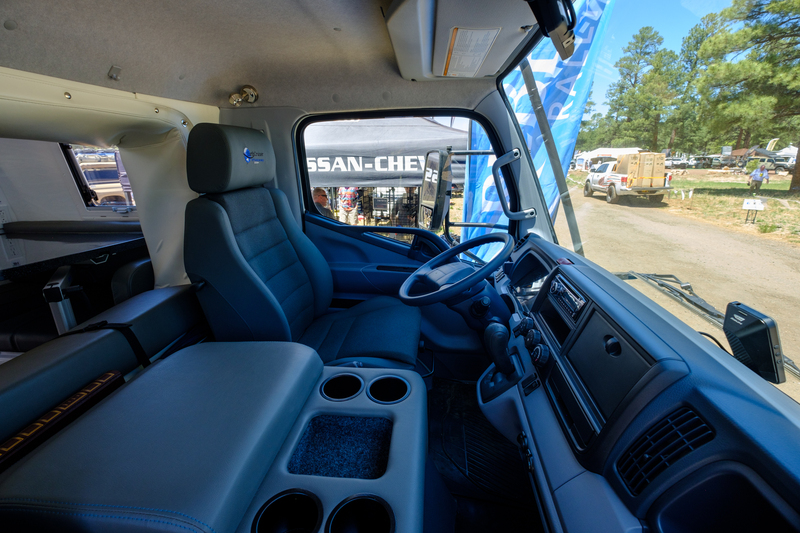 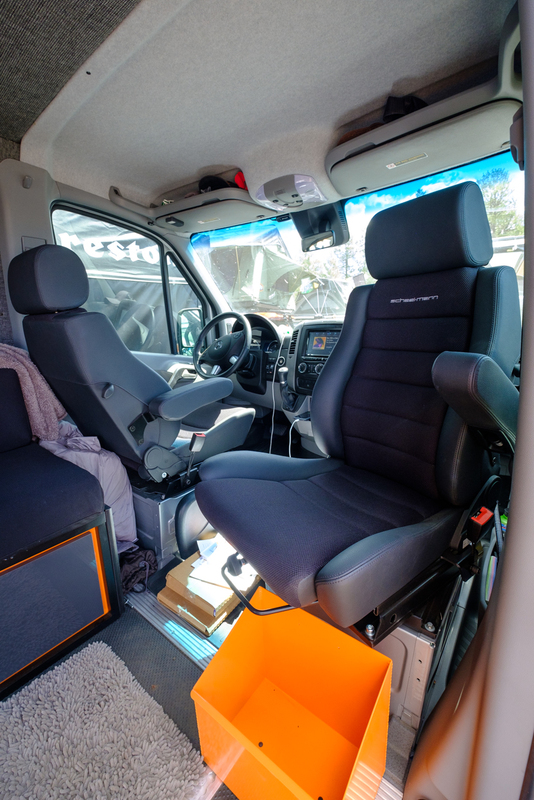 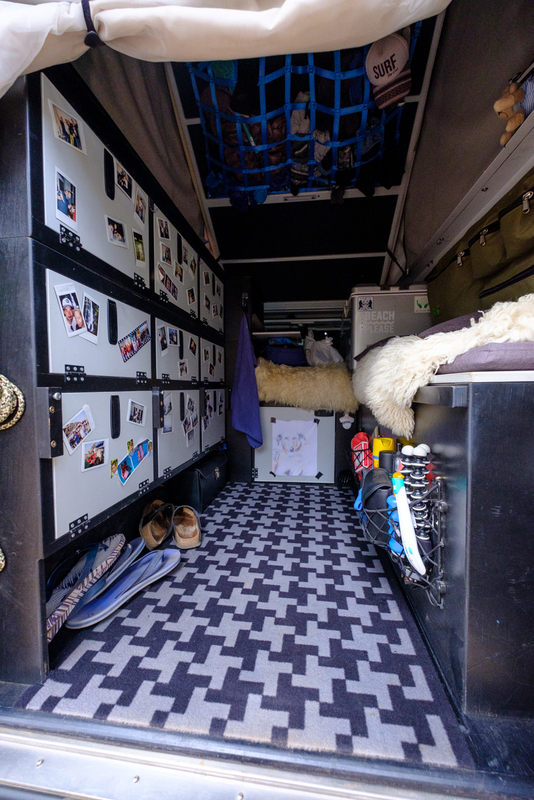 We took a peek inside one of their anniversary edition trucks, which includes a number of special features and graphics, including some embroidered Scheel-Mann seats. 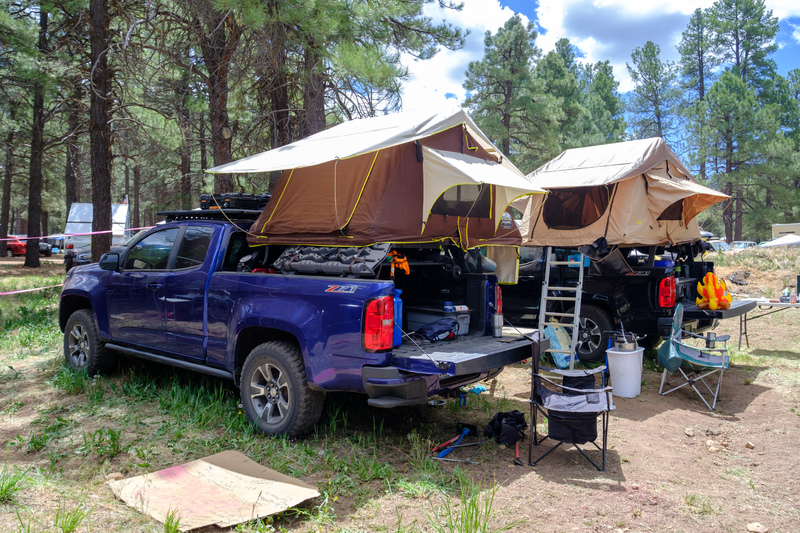 The happy couple below were thrilled with their Kimberly Kamper and couldn’t stop smiling when I asked them about it. 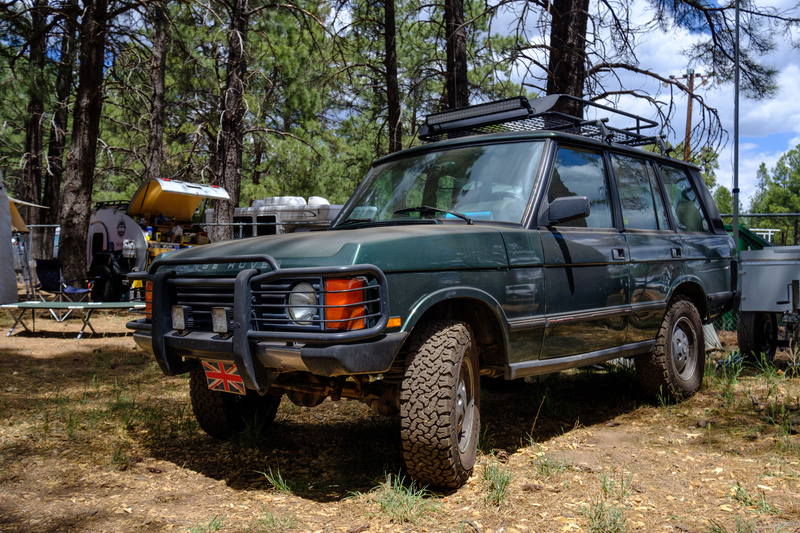 After a closer look at this off-road beauty, I could see why. 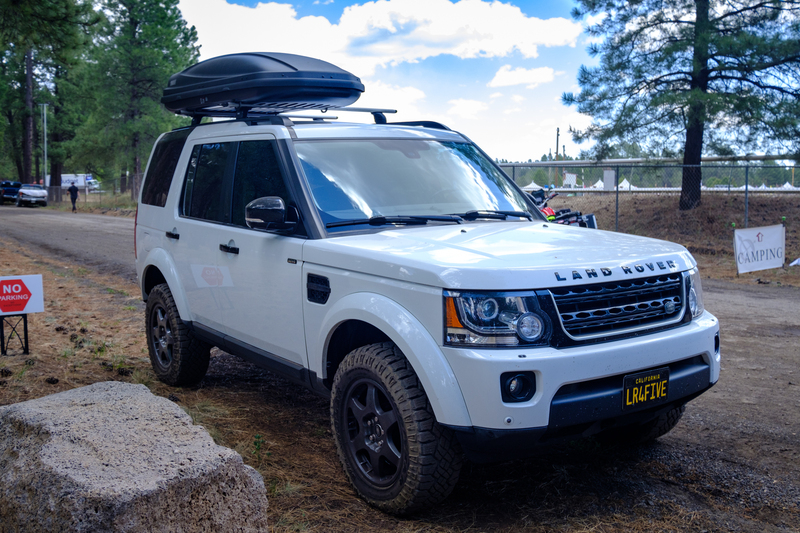 It’s comfortable, capable, and after years of use still looks like new. 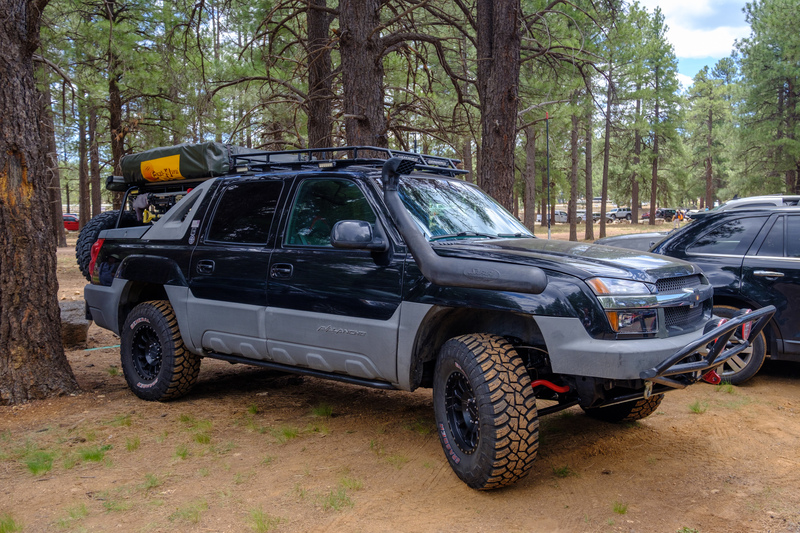 Enjoy, you two! 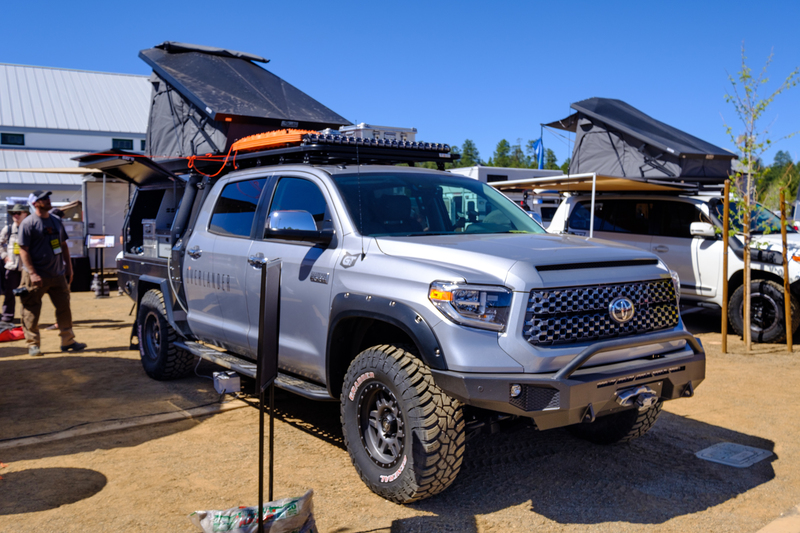 Expedition Overland always has cool trucks, but they went above and beyond with this new Tundra. 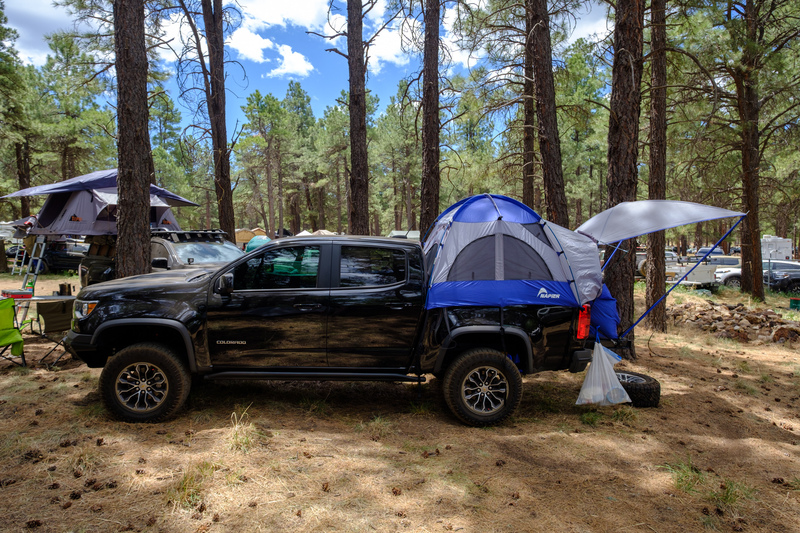 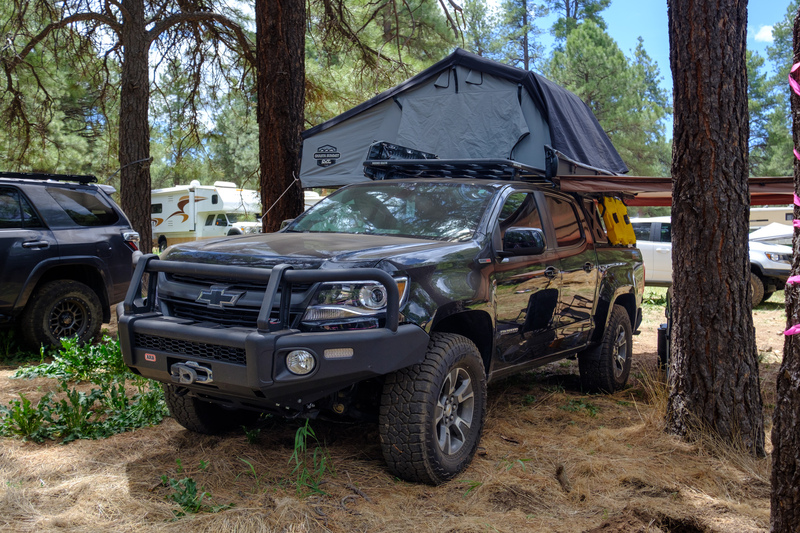 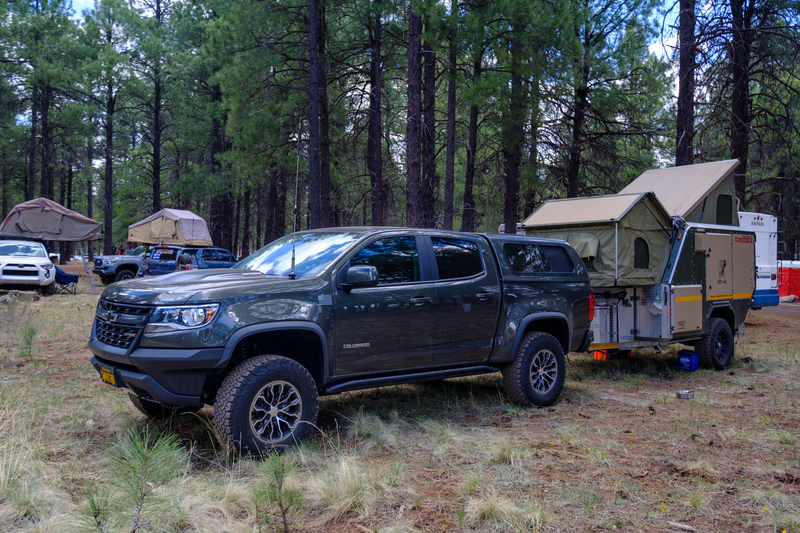 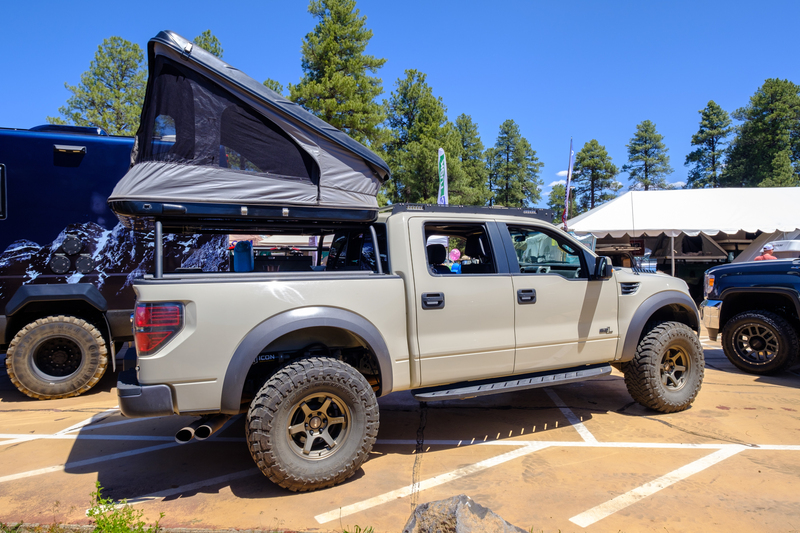 The Patriot Campers rear tray and canopy with the Eezi-Awn stealth tent are a great-looking combo, and quite possibly our favorite aspect. 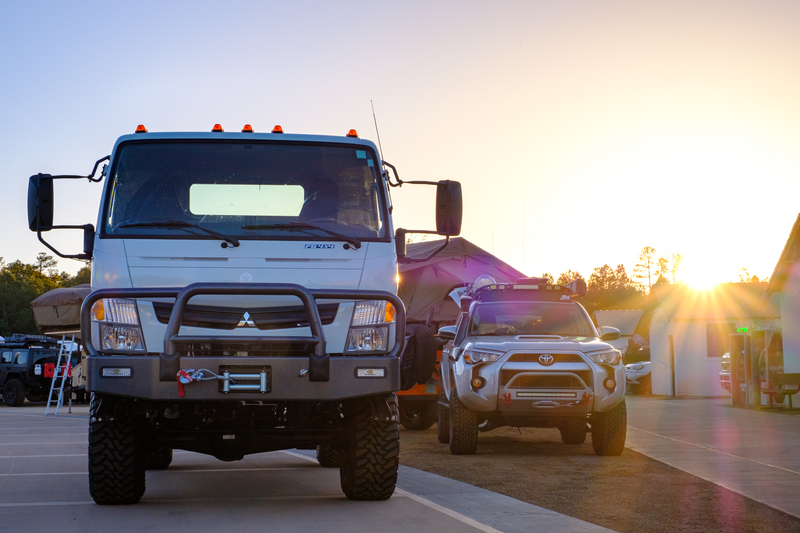 If you had to choose between the 70 Series above, or the Defender 110 below, which would you choose? 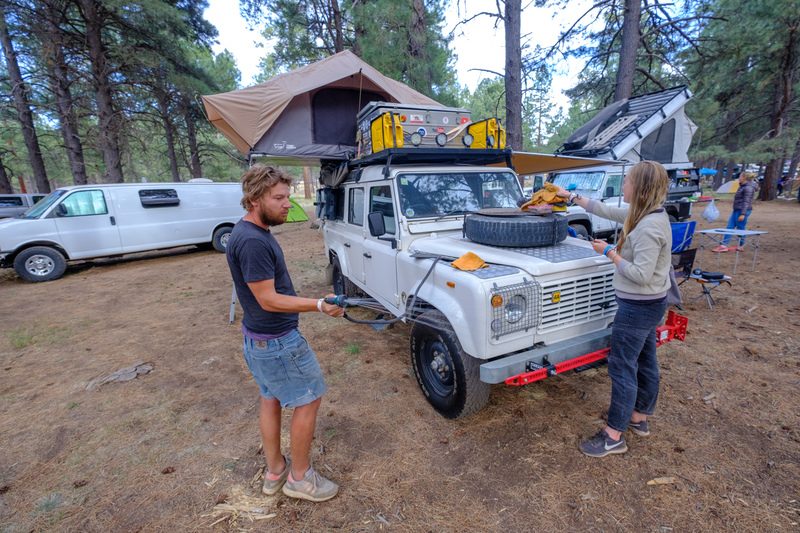 We don’t know if we could decide! 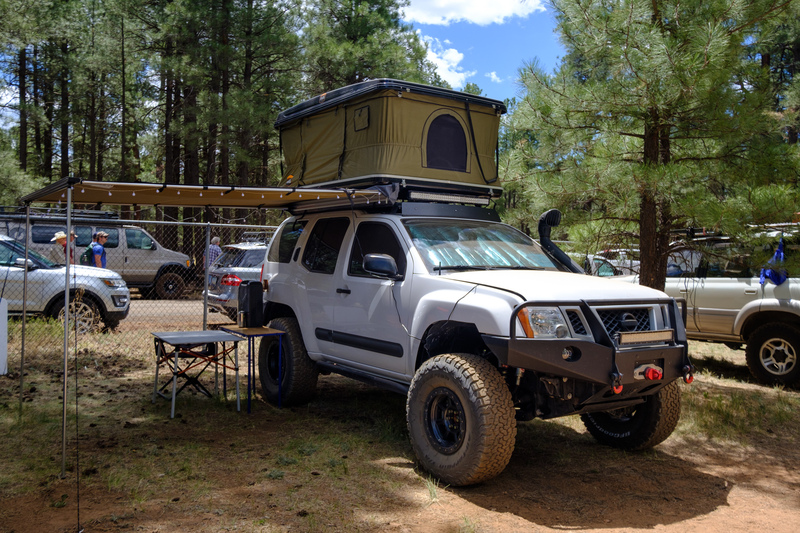 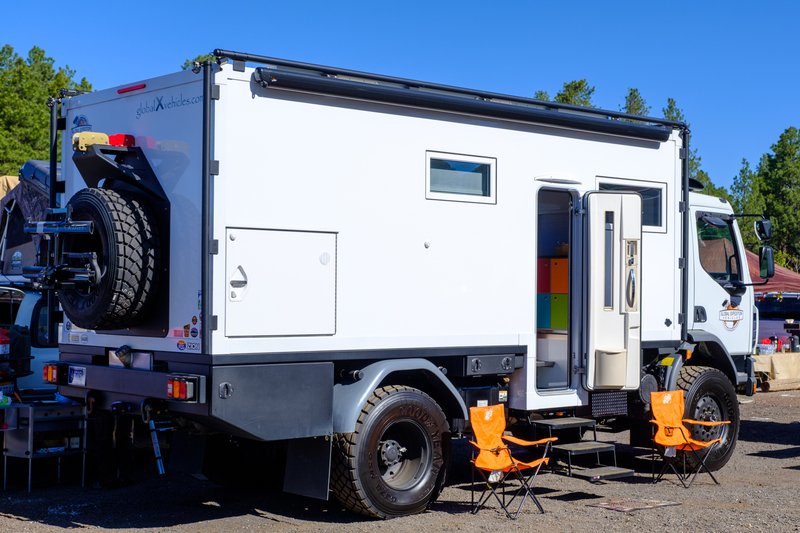 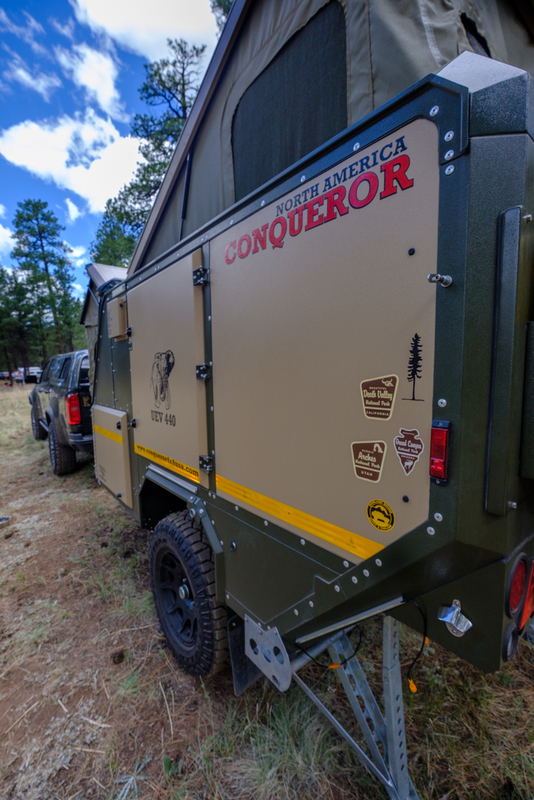 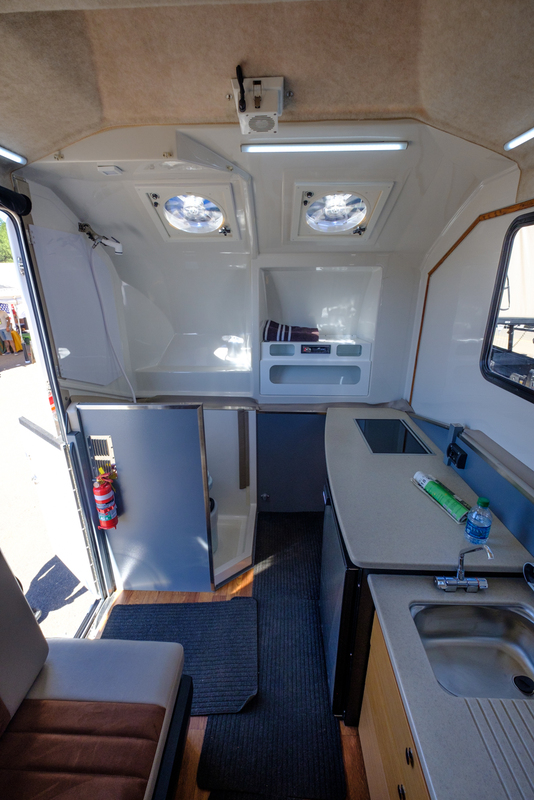 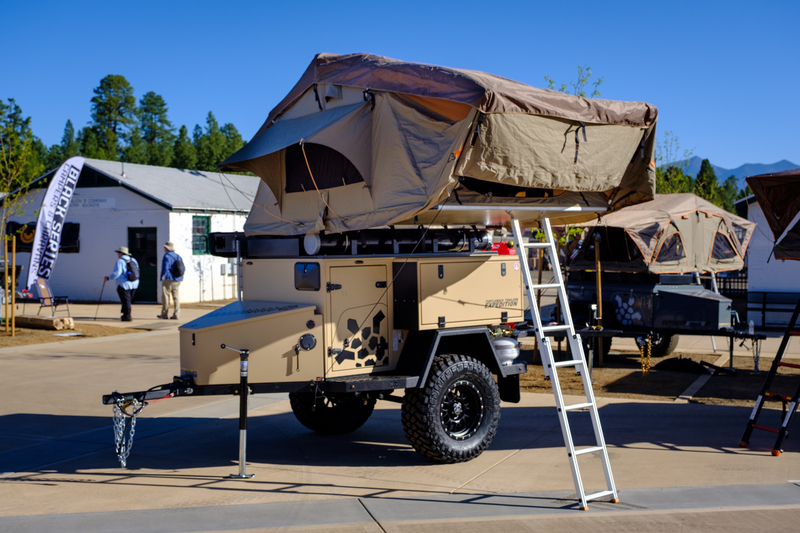 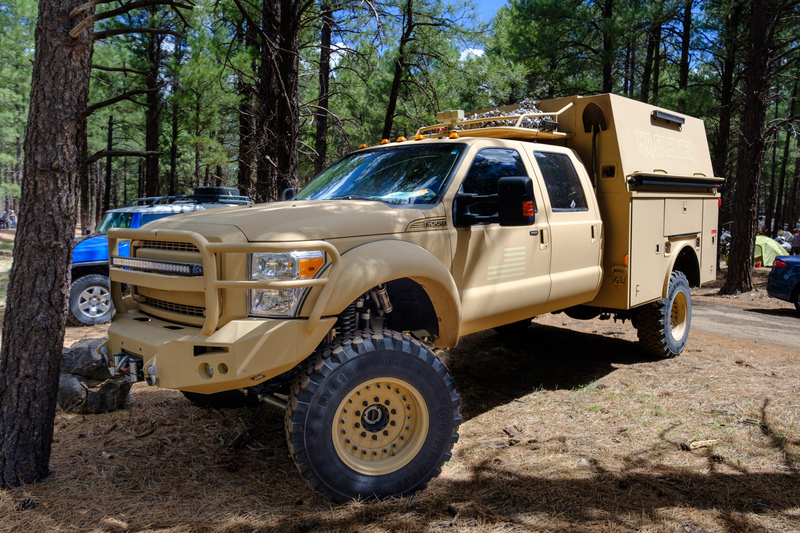 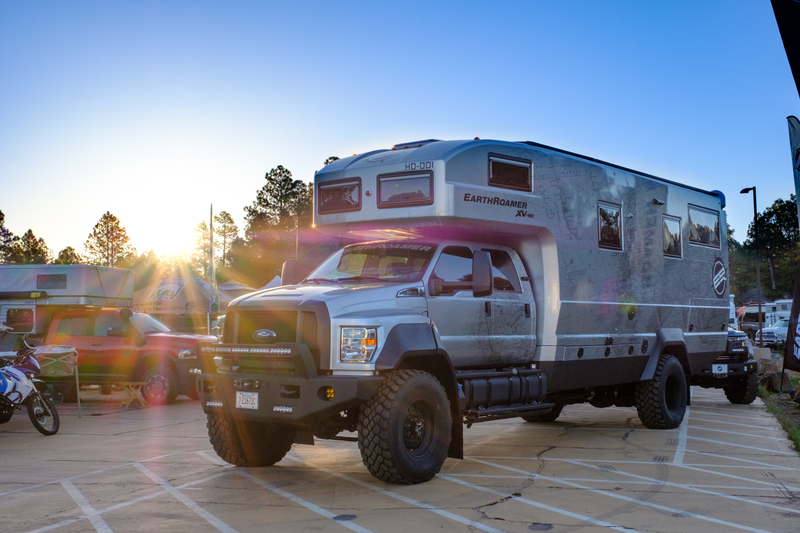 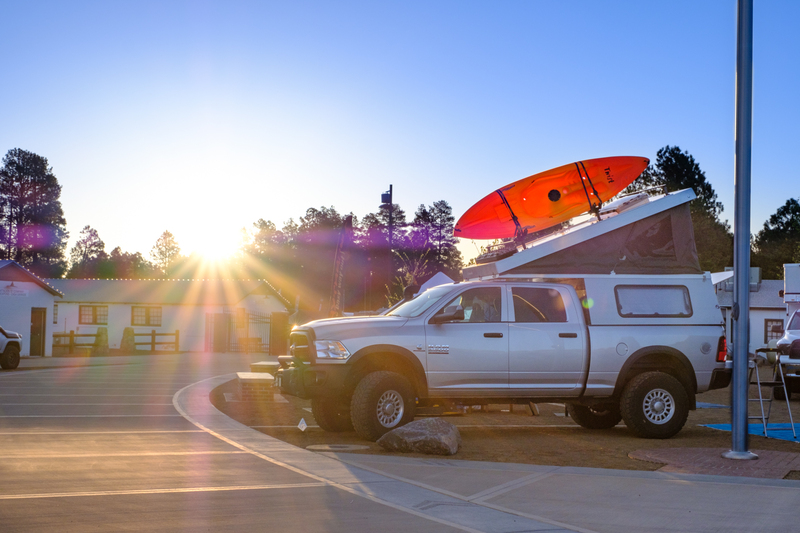 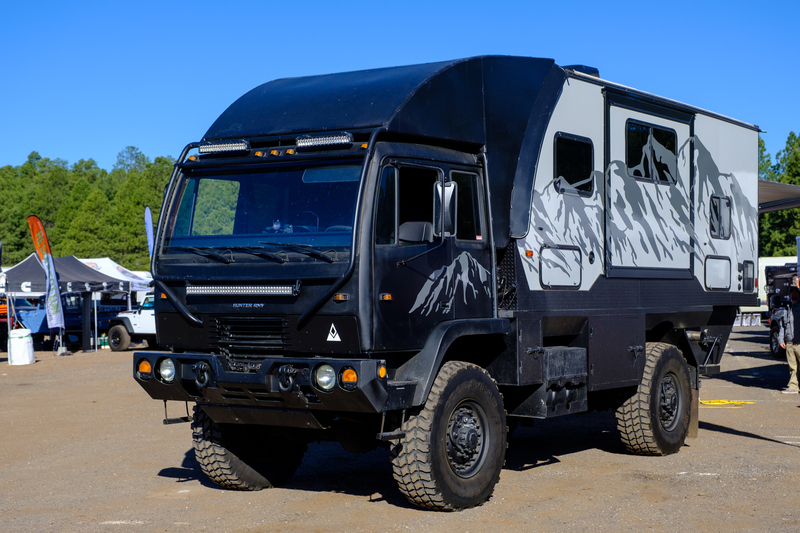 One of the most desirable trucks at Overland Expo was easily the Outpost II camper from American Expedition Vehicles. 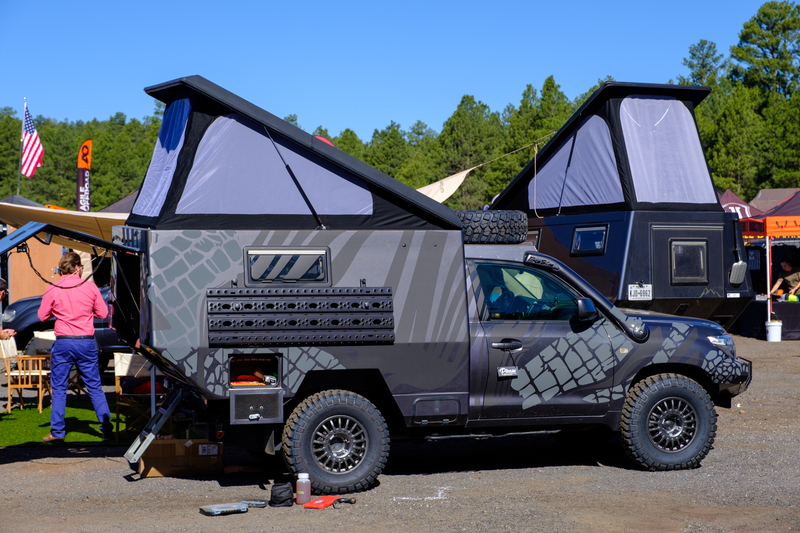 We first saw this at SEMA, and it has since progressed through the buildout with a more complete interior. 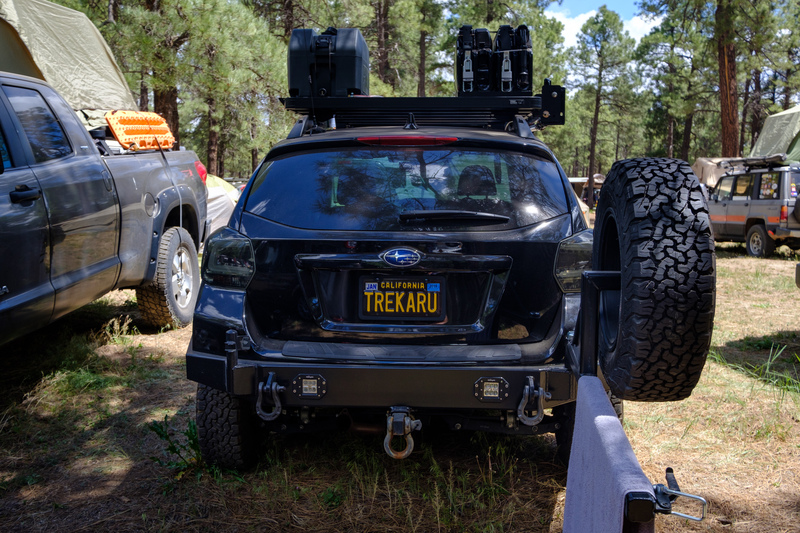 Look for more details in Overland Journal soon. 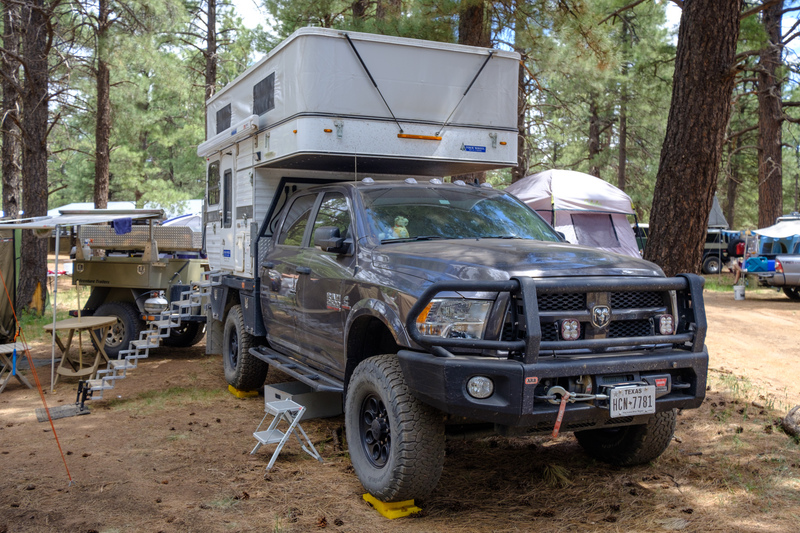 Besides the XOverland Tundra, Patriot Campers had one of their rear trays on this RAM 2500. 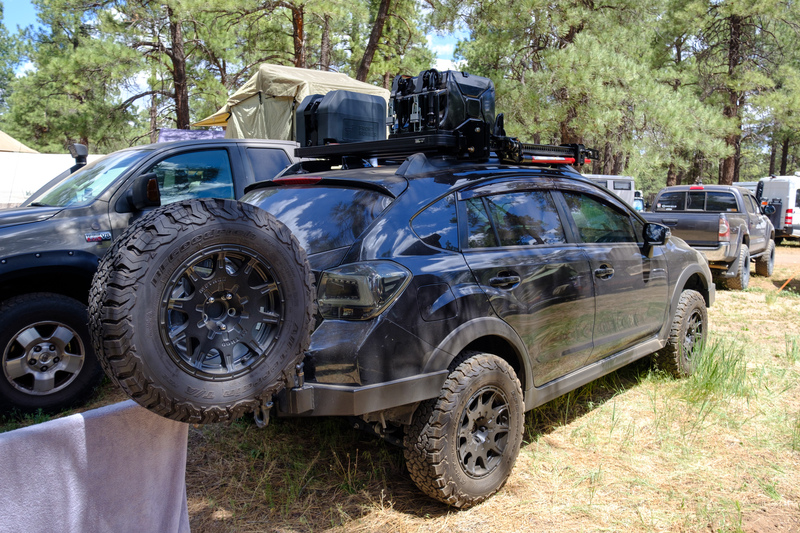 We don’t know if this trend will catch on, but we sure hope it does. 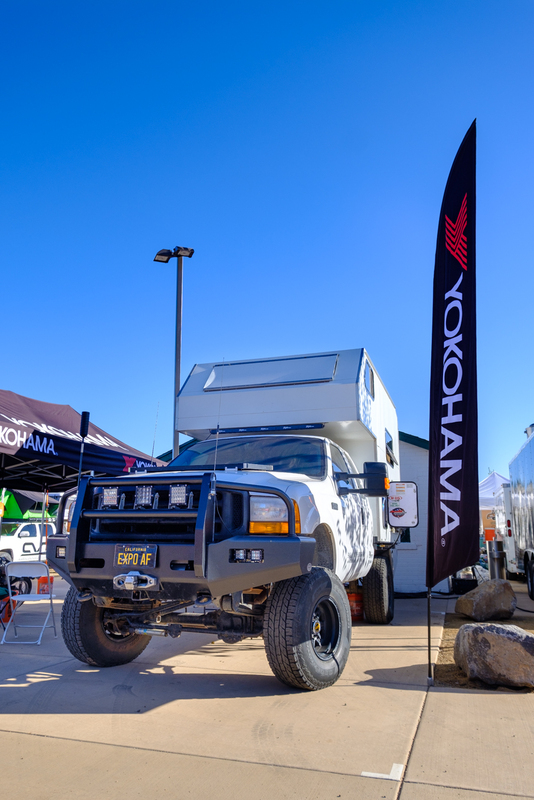 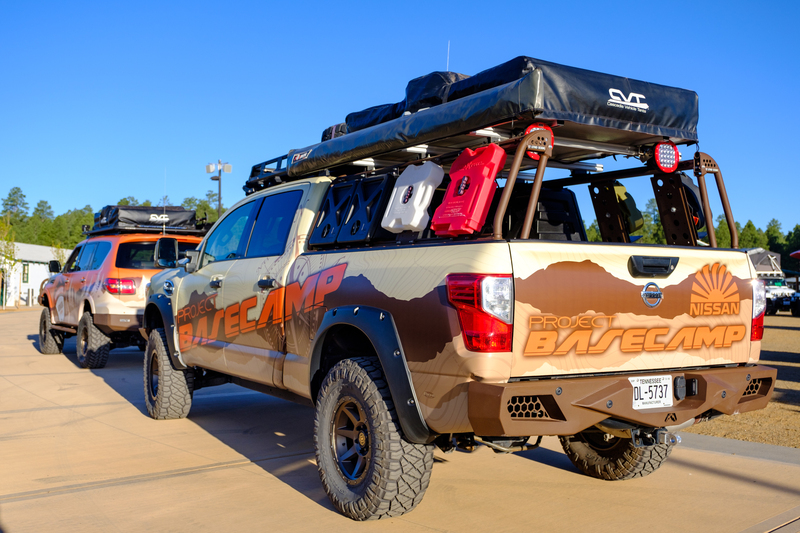 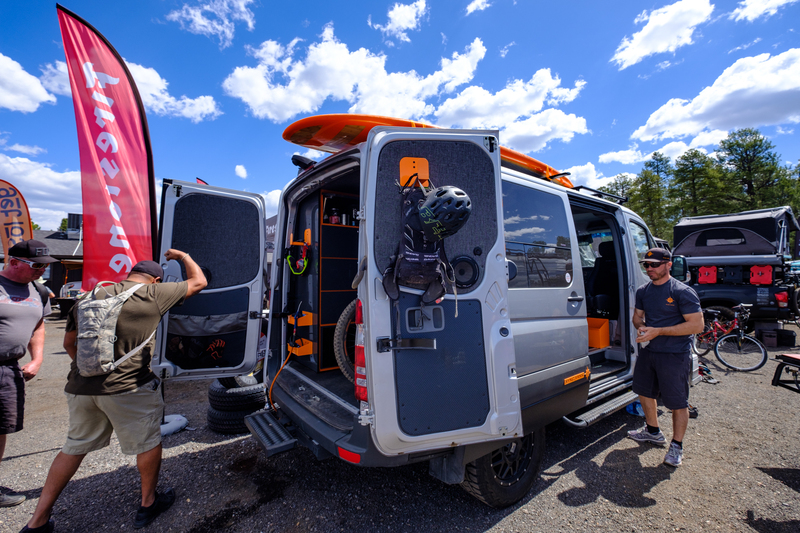 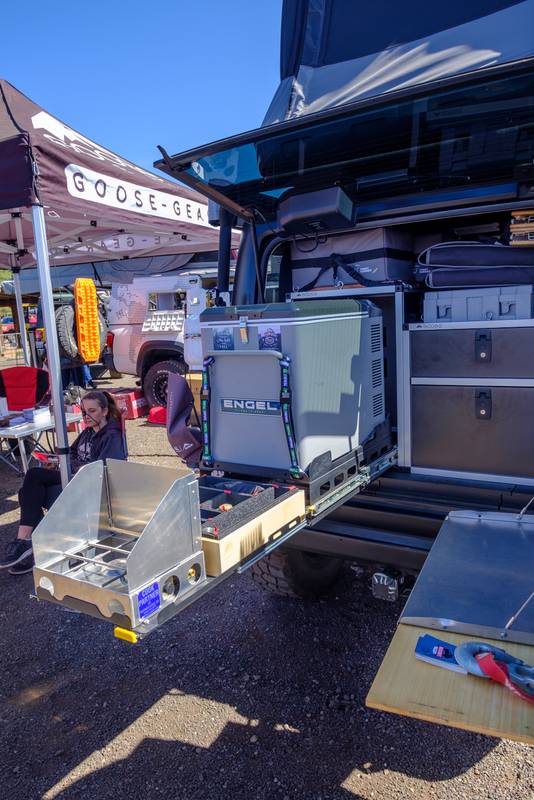 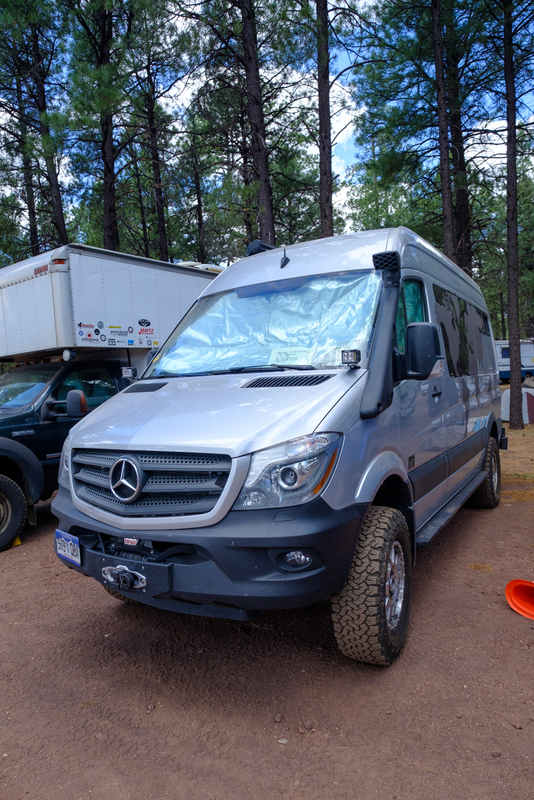 There’s still more Overland Expo content to come, so keep an eye on the front page for more of our favorite equipment from the show!